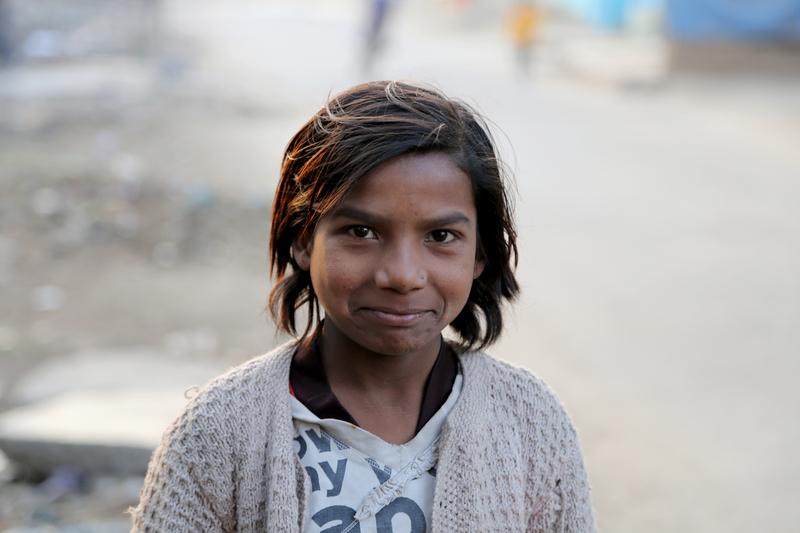 …It has been seven months since I departed India and yet I feel in many ways as though I never left. 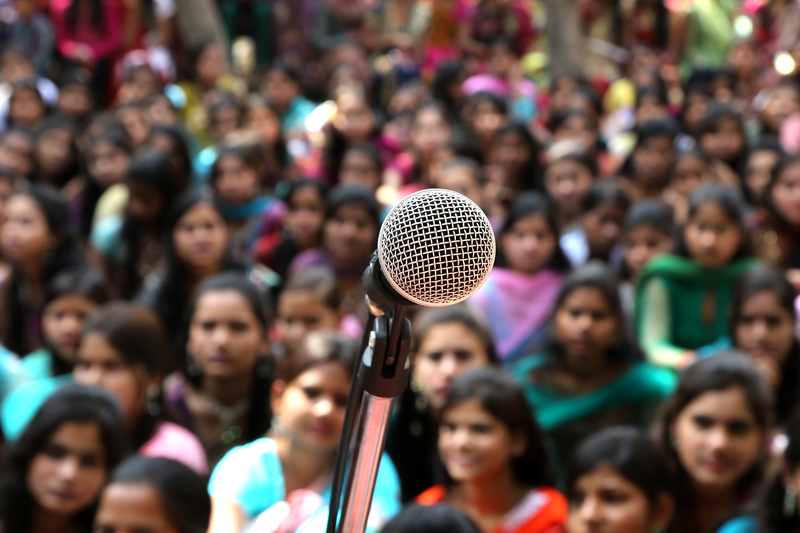 The constant din of automobile horns, pounding of factory machines, chants of salesmen in the streets, and clanking of billowing tuk-tuk engines create a unique atmosphere that cannot be forgotten. 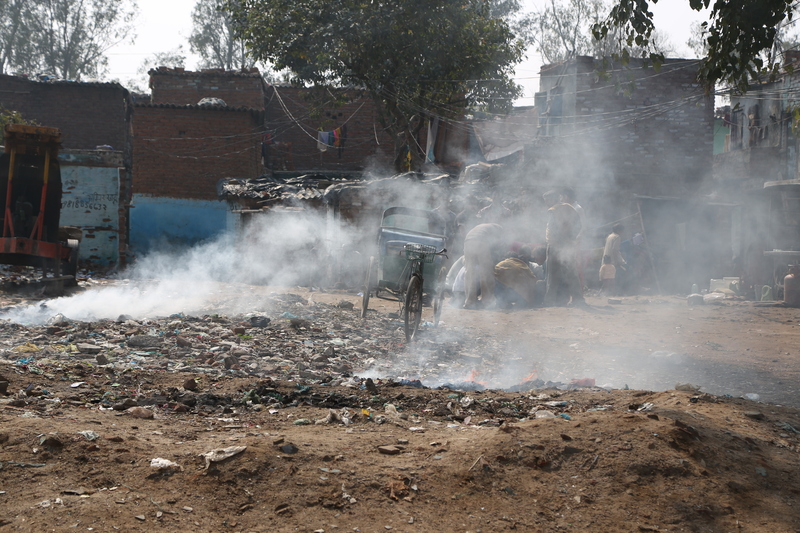 The air is thick with pollution and inhaling occasionally takes noticeable effort. It is very cold at night, to the point of needing fleece and a wool hat inside my sleeping bag. 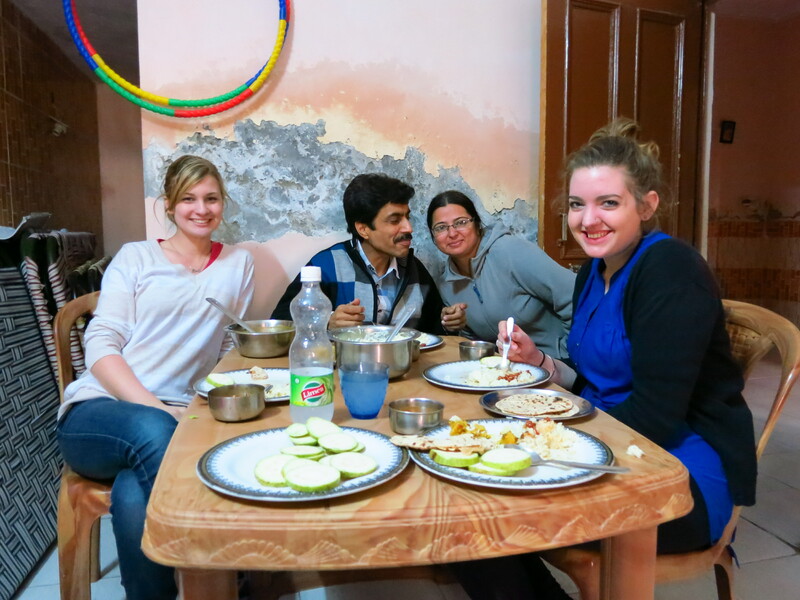 I unpacked and organized my belongings, set everything up as I had it before, and then joined two new volunteers, Amy and Bethany, for Mamta’s great cooking. 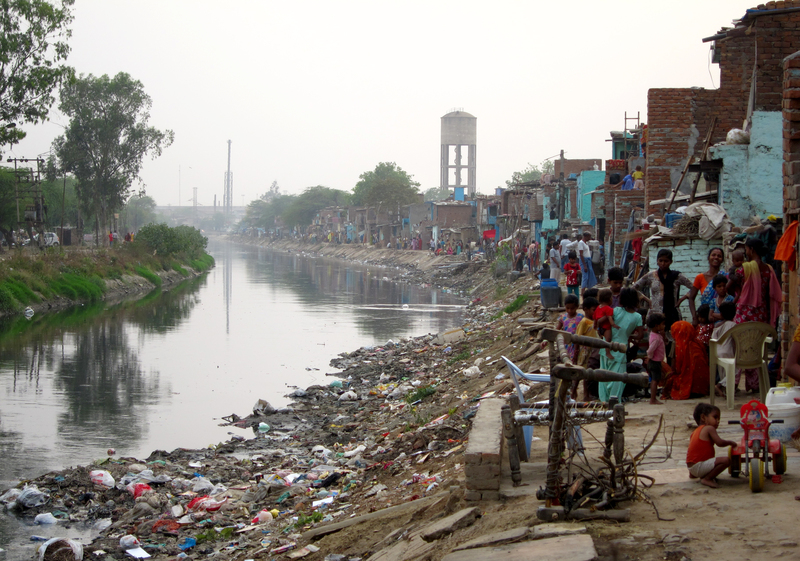 Then, off to the slum we went. 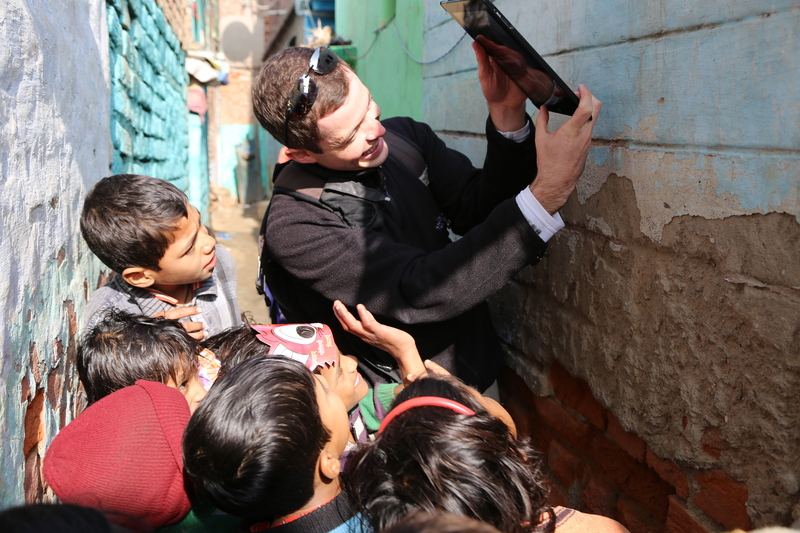 I was immediately recognized by hundreds of children and adults in the slum. Many of the adults even came forward to shake my hand and welcome me back. I had wondered many times what the reaction would be to my return. However, I did not predict or even consider the reaction I actually received. 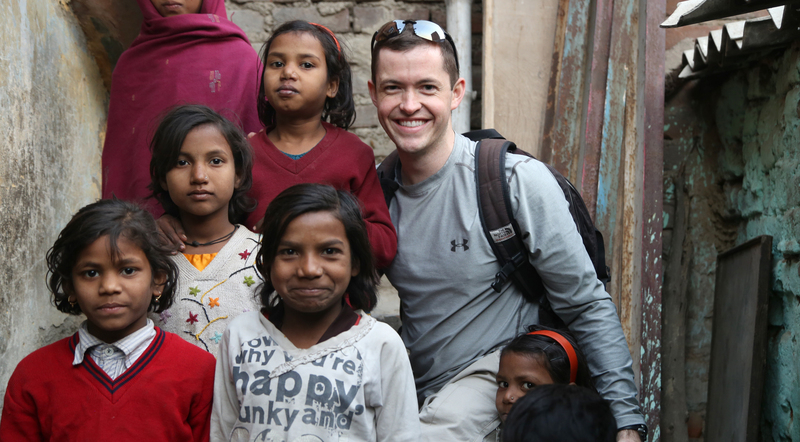 Everyone I had interacted with before in the slum knew that I was coming and the day that I was supposed to arrive. No one, therefore, was surprised by my arrival. 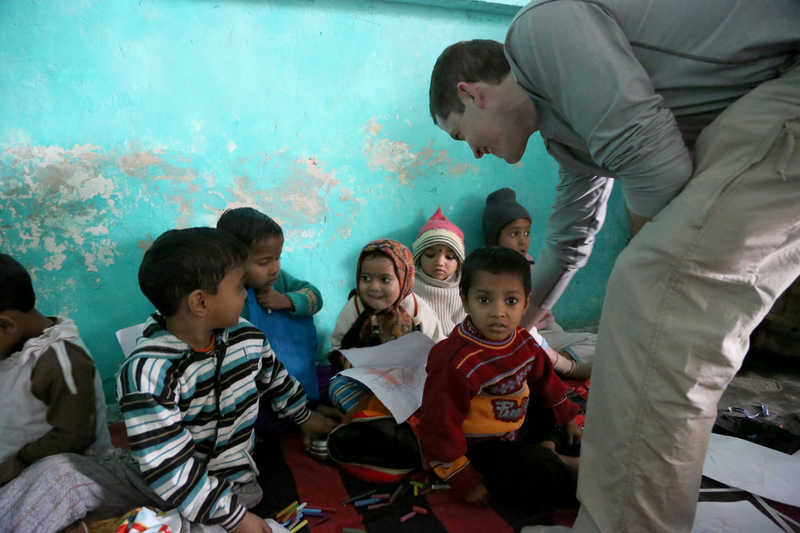 Interestingly, many of our students seemed initially hesitant to approach me. They would peek their heads around a corner, see me notice them, and run away with big smiles on their faces. It was as if many of them were playing a game of hide-and-seek. Neha ran to get something to show me. Before I left last May, I had given a picture of my family and me to each of the students. 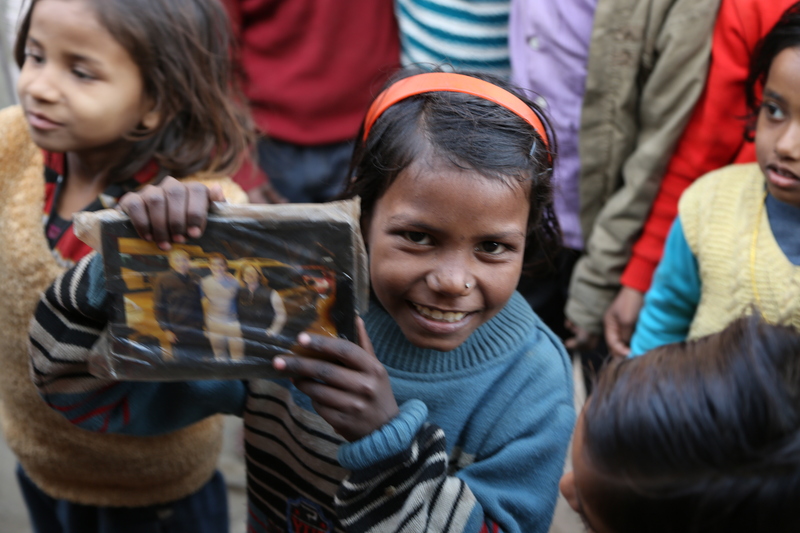 Neha’s family framed the photo and keeps it in plastic covering on the wall of their tiny dwelling. She was so proud to show me she still had it. 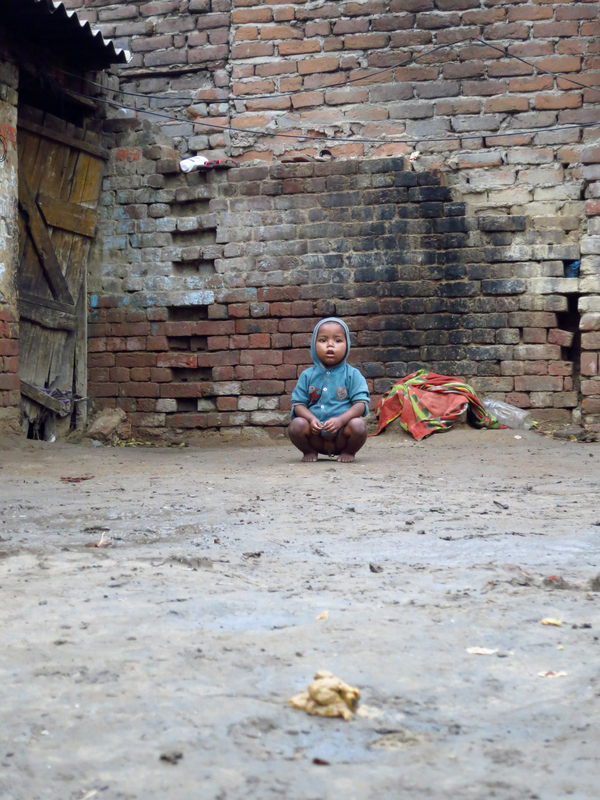 Manish and his mother Dolly were out in public prominently sitting along the main route through the slum. Manish has continued to receive treatment during my absence. 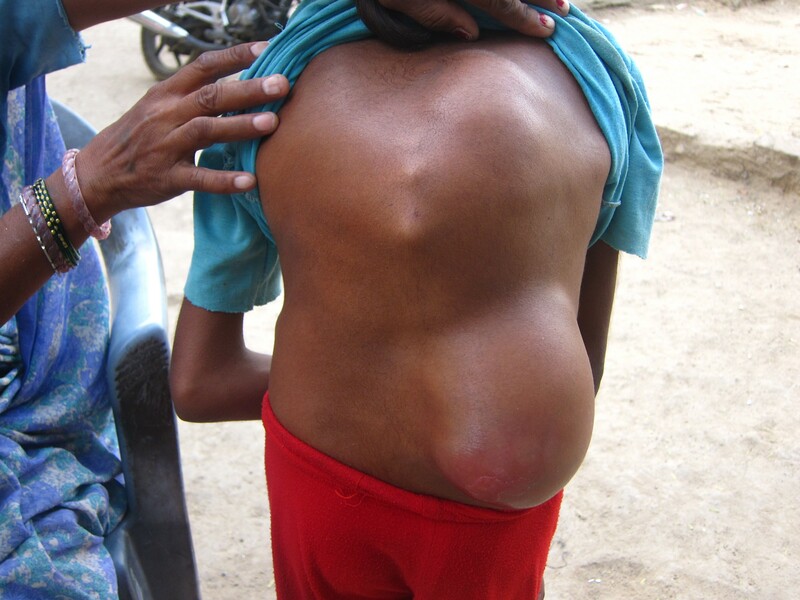 His venous malformation does not appear to have grown, which is cause for celebration. I wish that we could do more but at this time surgery is still not an option here. I will take him to a physician soon for closer follow-up. Mithlesh and his family have had a very tough time since I left. 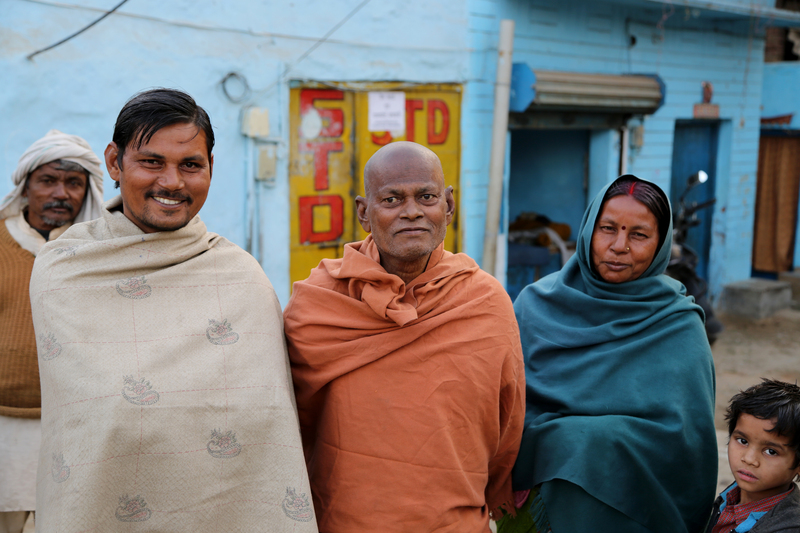 His father Narayan (center) was diagnosed in September with Grade IV Glioblastoma Multiforme, a very aggressive malignant brain tumor. 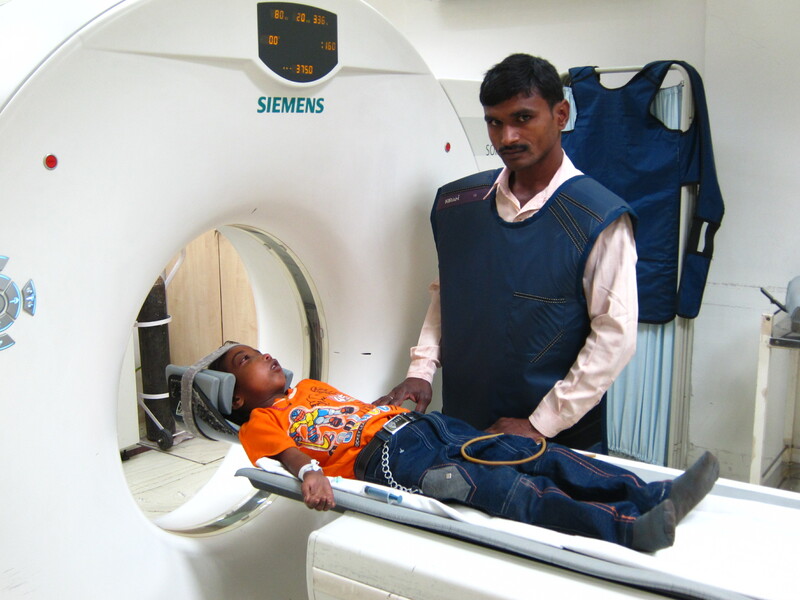 He has undergone surgery and many rounds of radiation treatment at government hospitals. He remembered who I was and thanked me extensively for coming back. However, he can no longer remember the names of even his own family. His family, consisting of about 40 individuals, has pooled their money to support the tremendous expense of his medical care. They have spent all of their meager savings fighting for his life. All of the students ask me if my friends Heather, Natalie, Crystal, Rehan, Dina, Jess, Yeonui, Merril, Win, or others are coming too. They ask for each of you by name and still have many of the gifts you left them. I tell them that you will not be back this year but perhaps in the future. Then they wobble their heads, smile, and continue on. Ajeet was very excited to see me and anxious to tell me about multiple awards he has received at school. I asked him more about them and he sprinted away. He returned a few minutes later with his “Certificate of Honor” for a listening skills test and two gift-wrapped pencil boxes as prizes, both of which he placed back in the wrapping paper after showing me. School is still out for winter break and will resume on January 16. 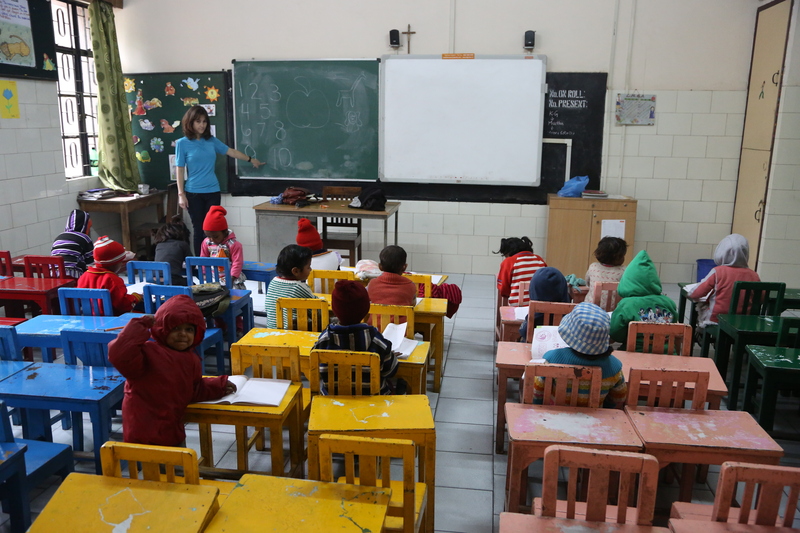 Our students do, however, have a special class every morning during the break. 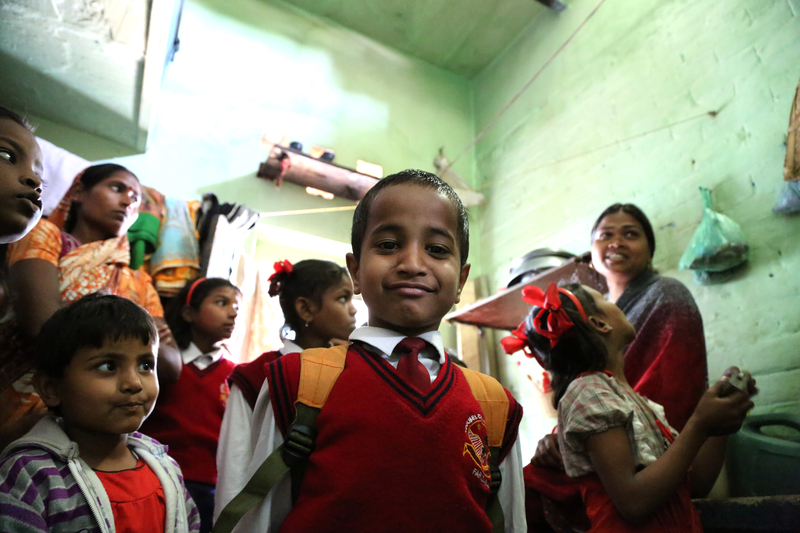 Their class had already ended on this day so our students had returned home and removed their uniforms. 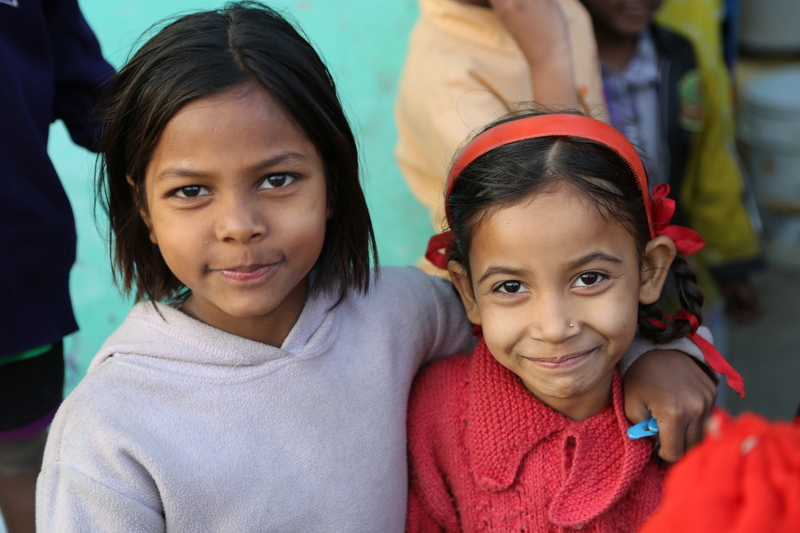 Without their school attire, they are largely indistinguishable from other children in the slum (other than the girls’ red headbands, which they seem to wear all of the time and help me spot them from hundreds of feet away). 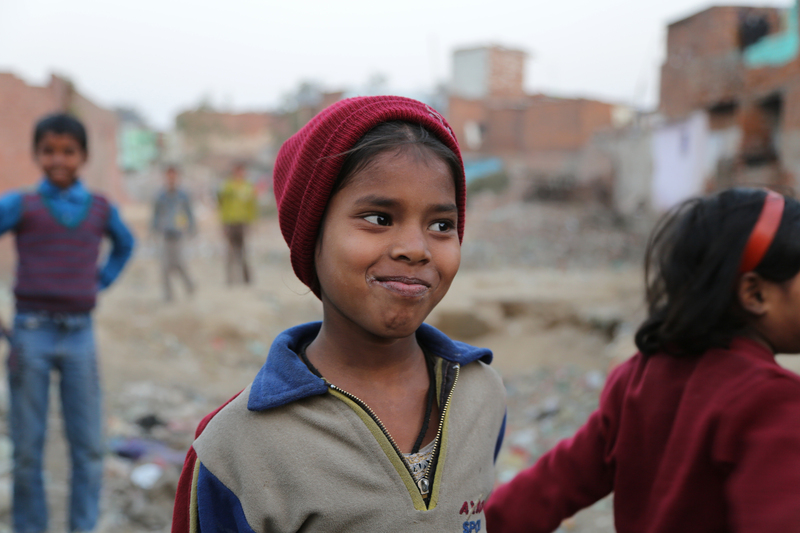 Somewhat to my amazement, our children are fitting in with their peers in the slum with hardly any problems. 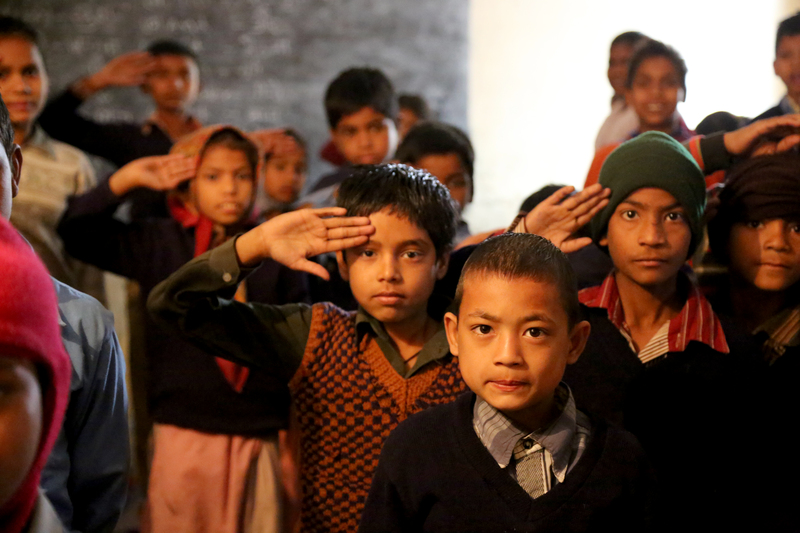 In the next post, we will join our students in their winter uniforms to their special class. Our children have learned a truly incredible amount in the last year and I cannot wait to share their success with you. 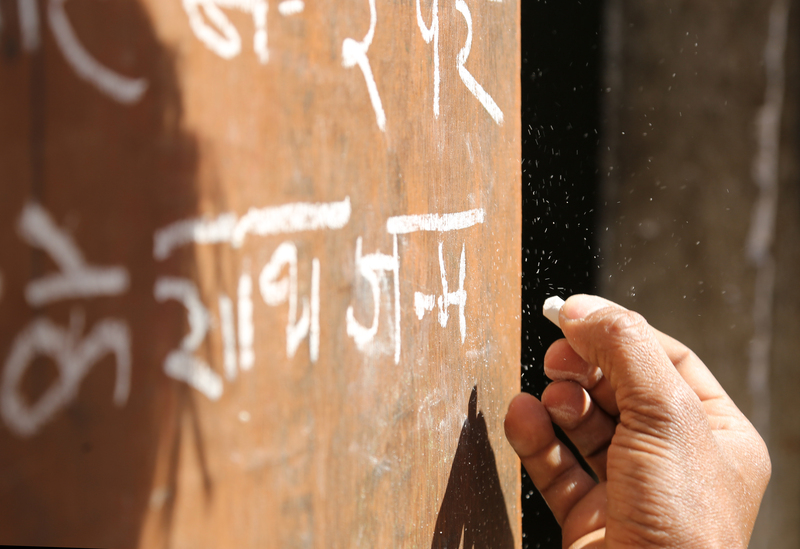 …In the late afternoon of April 9, I walked into the slums expecting to teach our students English and Math for a couple of hours before dinner. 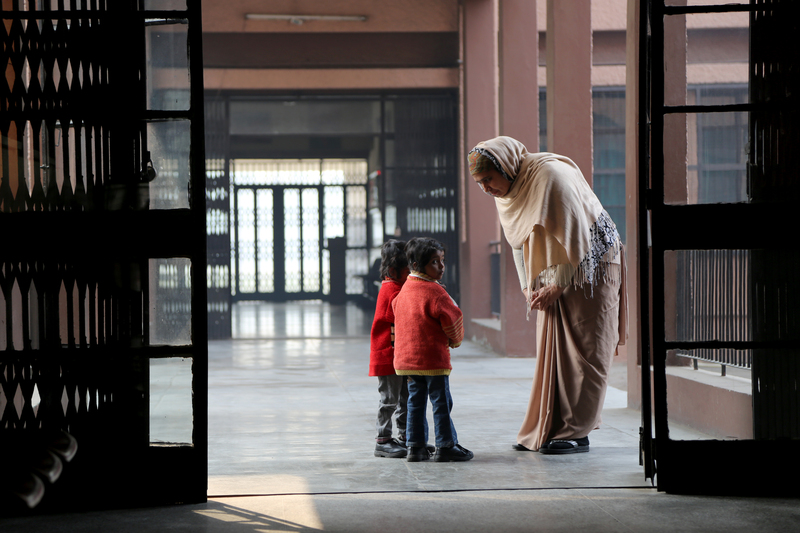 However, when I arrived at the school, a young girl and her father whom I had never met before were waiting to speak to me. 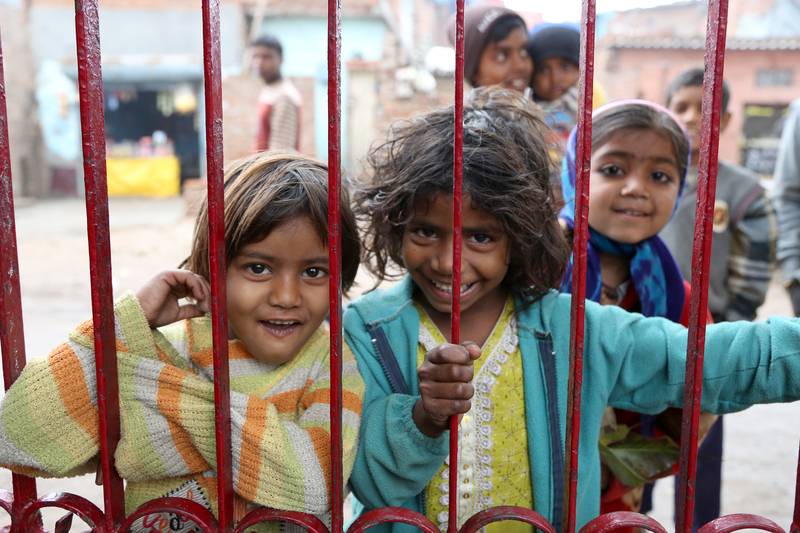 They stood just outside the door of the barren, dusty slum school looking directly at me as if they had been studying my daily routine. The bright orange shirt of the little girl drew my attention to her already striking face. Obviously in need of healthcare, I knew exactly why she was waiting for me. 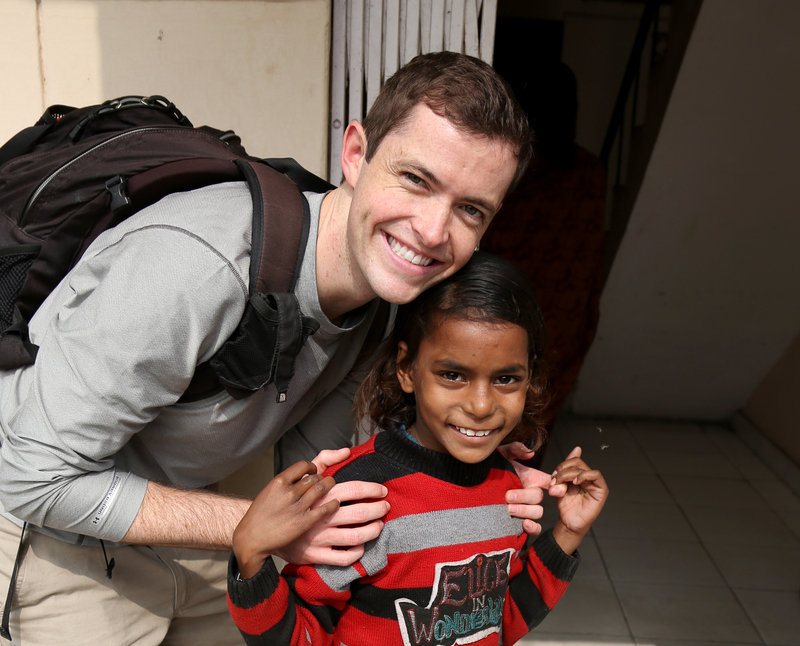 I knelt down and introduced myself to the little girl in Hindi. Most Indians laughed when they heard my assuredly terrible accent for the first time, but she never even hinted at a smile. She didn’t speak to me either. She diverted her eyes and seemed all too accustomed to curious stares. 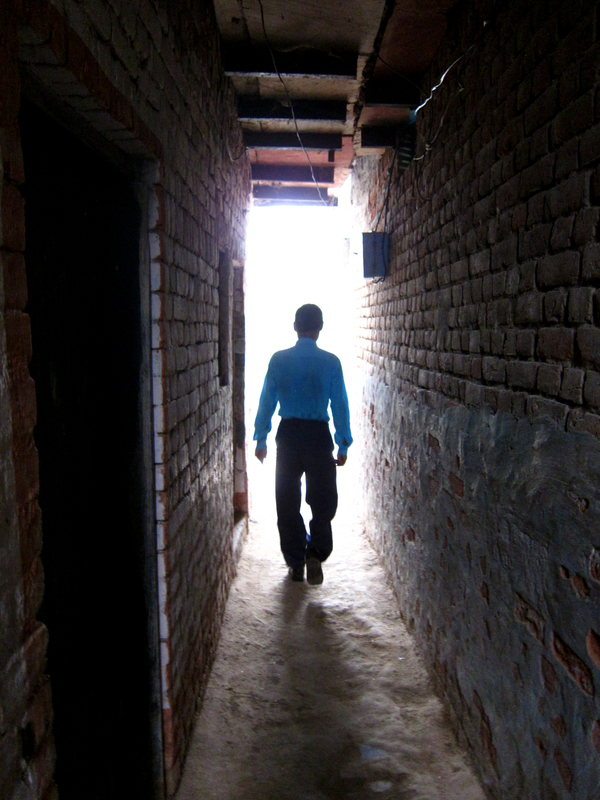 With Mithlesh translating, I met the father and began to ask him questions. 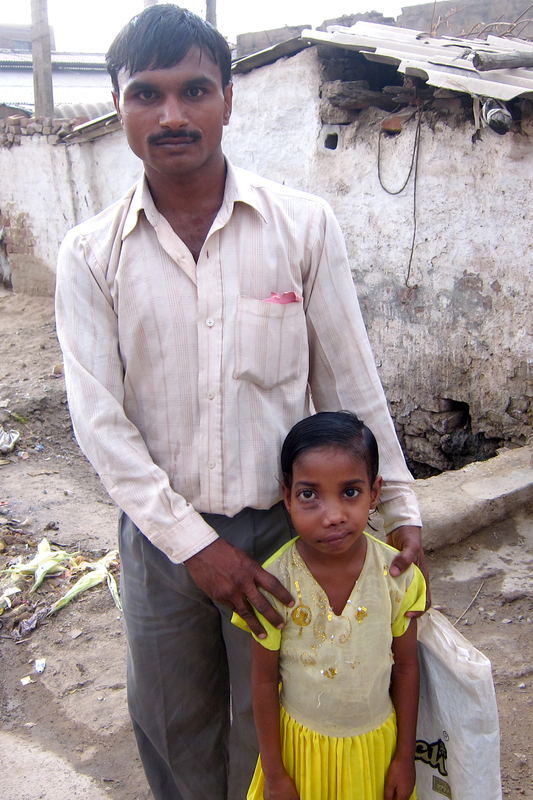 His name was Rajesh and his daughter, I discovered, was Prianka. Her father told us that Prianka was 7 years old and that the right side of her face began to grow unusually large when she was only 6 months of age. 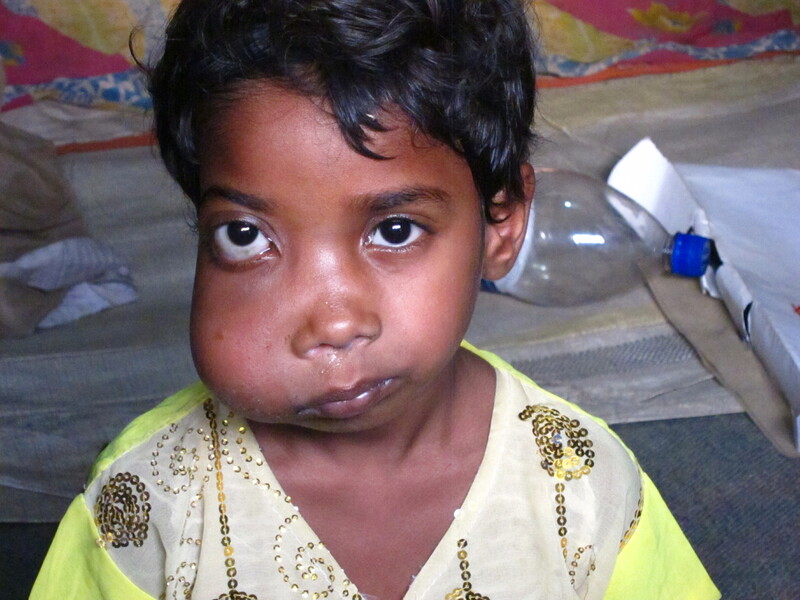 For the past 6 and a half years, Prianka’s cheek had continued to grow at an increasingly alarming rate. I knelt down again and got out my camera to take pictures of Prianka for the surgeons. She turned and modeled her deformity without expression or a peep. I felt sad for Prianka. 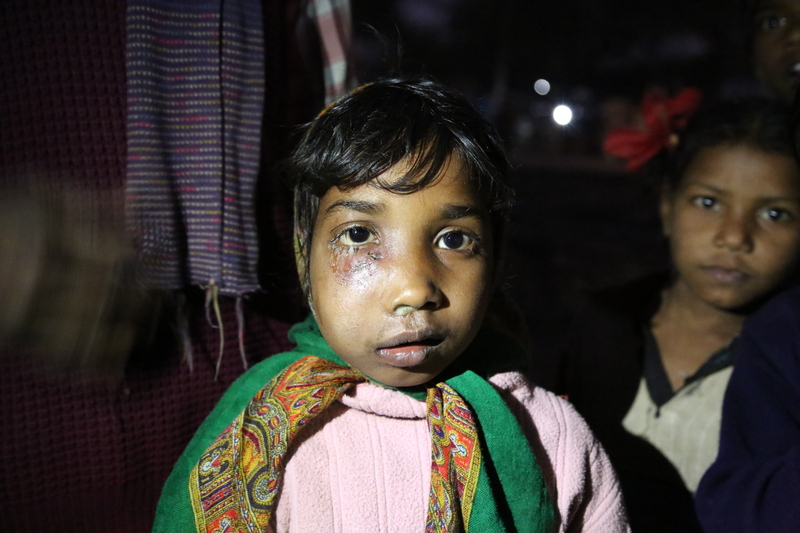 When I asked her father why she had not been treated earlier, he pulled out two opaque plastic sheets from a plastic bag he was holding. 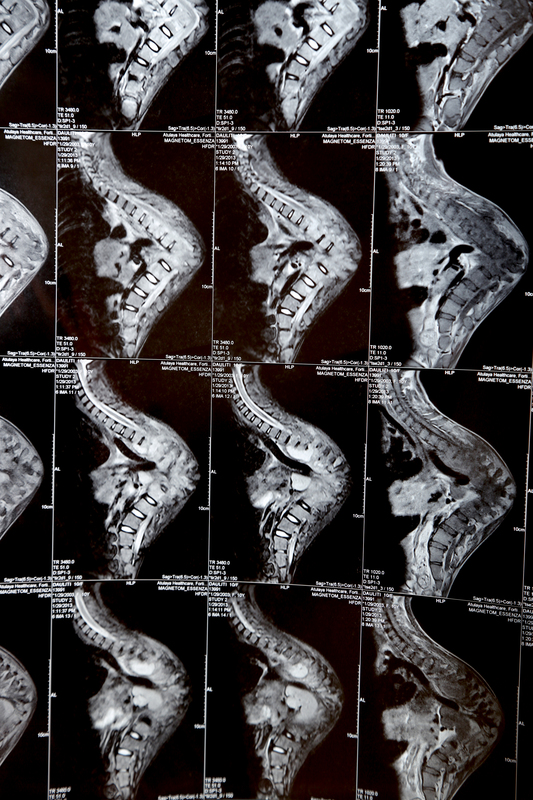 They were small x-ray films that looked like they had been produced in 1965. I could hardly even tell that they were x-rays of Prianka’s head. They were essentially useless; so, I naturally wanted to know where they had been taken. 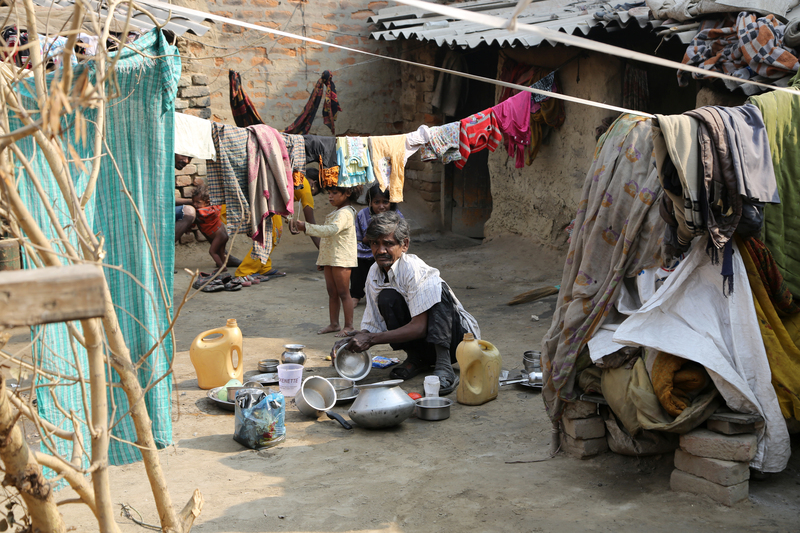 All this time talking to Prianka and Rajesh, I had assumed they lived in the slum. 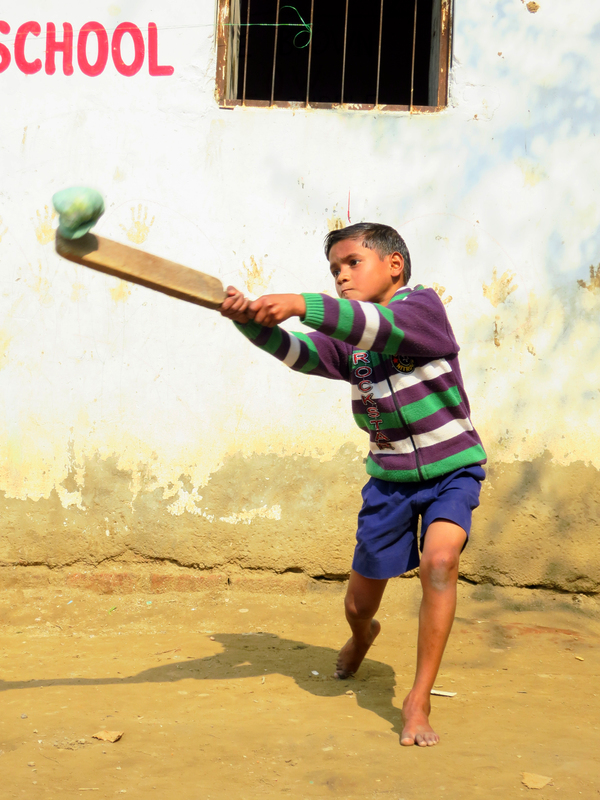 After all, I had just met Santosh for the first time less that one week prior and he had been born in the slum while I was there. However, I was wrong to assume that about Prianka; I wasn’t even close. 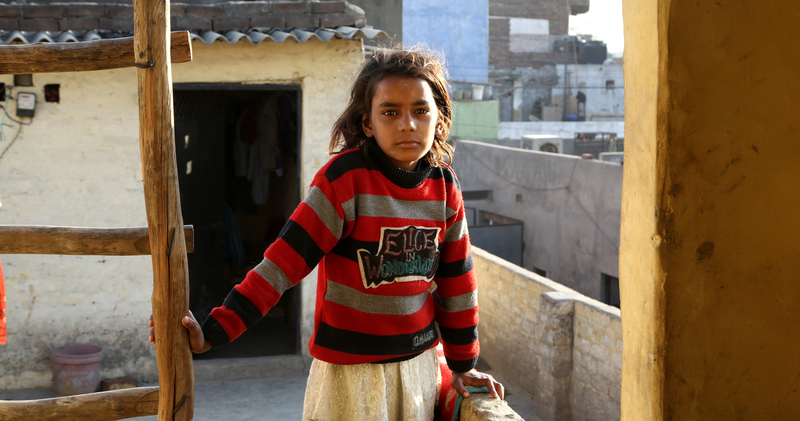 Prianka and her father had actually just arrived in Faridabad that afternoon. 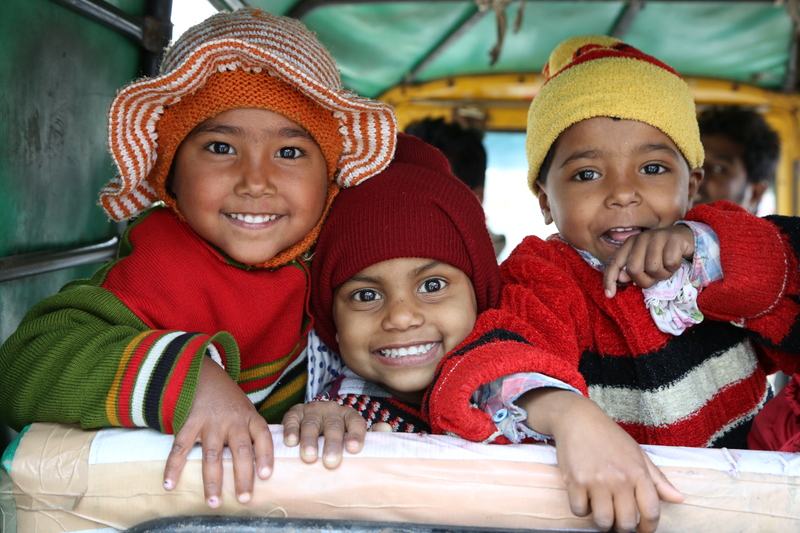 For the previous 22 hours, they had traveled from rural Bihar, one of the poorest states in India. 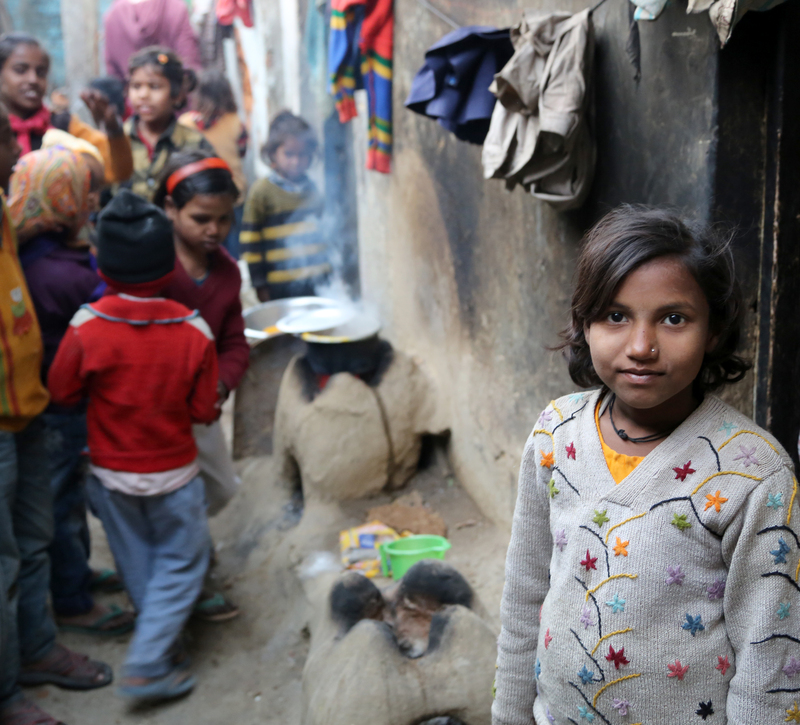 They had just traversed 600 miles of deserts and rivers aboard trains and buses because someone from their family had called and told them that there were westerners taking deformed children to hospitals and that they should come immediately to the Patel Nagar slum. 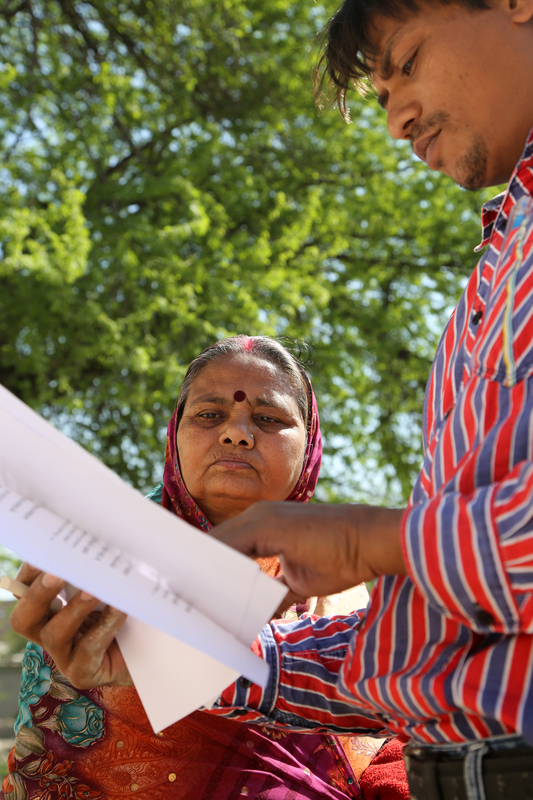 Without delay, without ever trying to contact me first, without ever even verifying that we would still be in Faridabad, Prianka and Rajesh left their rural and destitute homeland in the largest leap of faith and hope I had ever encountered. I was speechless. I stood thinking just how committed, courageous, and, well, crazy their plan was. But their mission was over now and it was the beginning of ours. 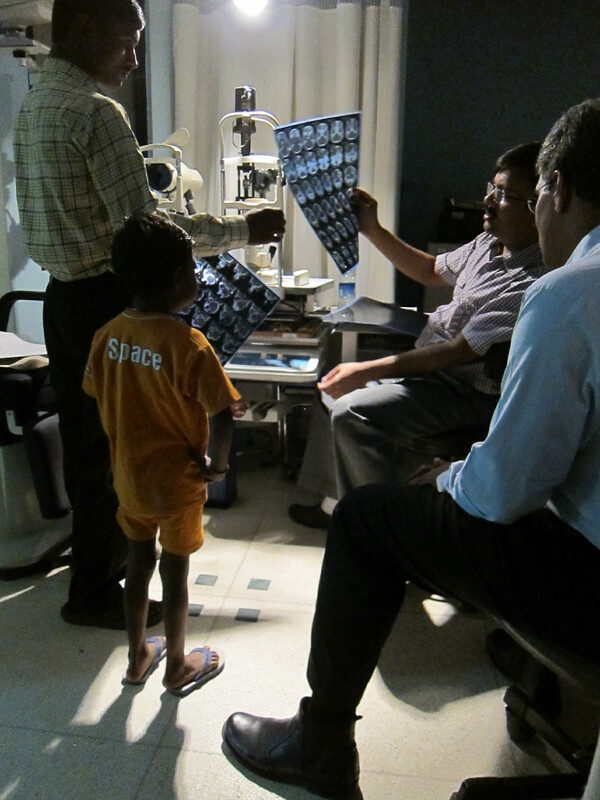 Just two days later, we were getting Prianka’s CT scans, blood tests, and consultations. 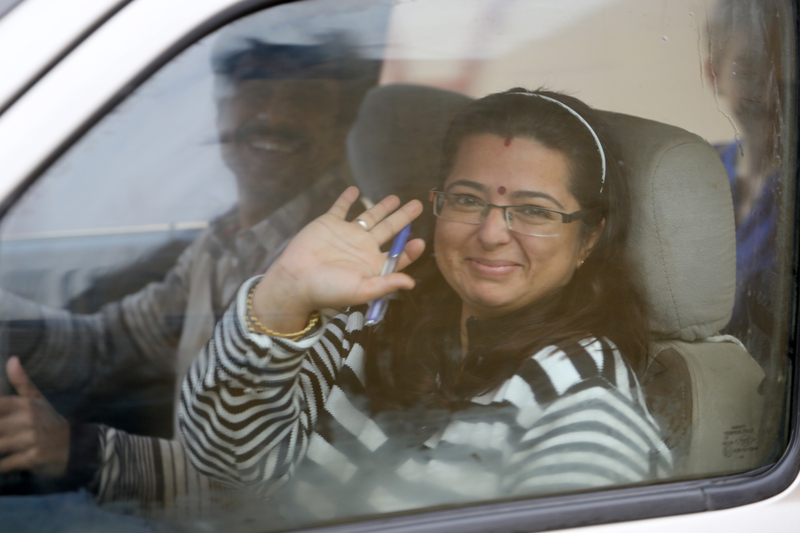 Having made inroads with many physicians while caring for Manish, Santosh, Moni, and Chandni, we were now treated like VIPs in the hospital. The plastic surgeon, whom I admire greatly, stopped his normal workflow and committed an entire morning of his time to the care of Prianka. He personally escorted us directly to the offices of the pediatrician, ophthalmologist, otolaryngologist, pathologist, and other surgeons for consultations about Prianka’s unique condition. We could not have received more exquisite service even if we had been royalty. Then, as suspected, news came back that a biopsy was necessary and a surgery would likely follow. The cost was going to be more than $3,000 but the plastic surgeon knew we didn’t have that much to give. I talked to the Chief Executive Officer of the hospital, but he could only offer a 10% discount for charity. 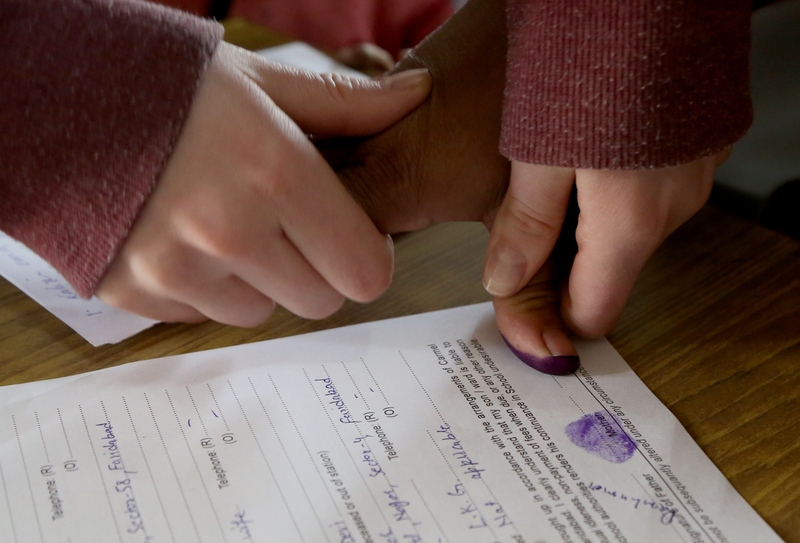 We returned to the slum with some big decisions to make over the coming weekend. On Sunday evening, I received an unexpected call from the plastic surgeon. He gave me the best news imaginable. 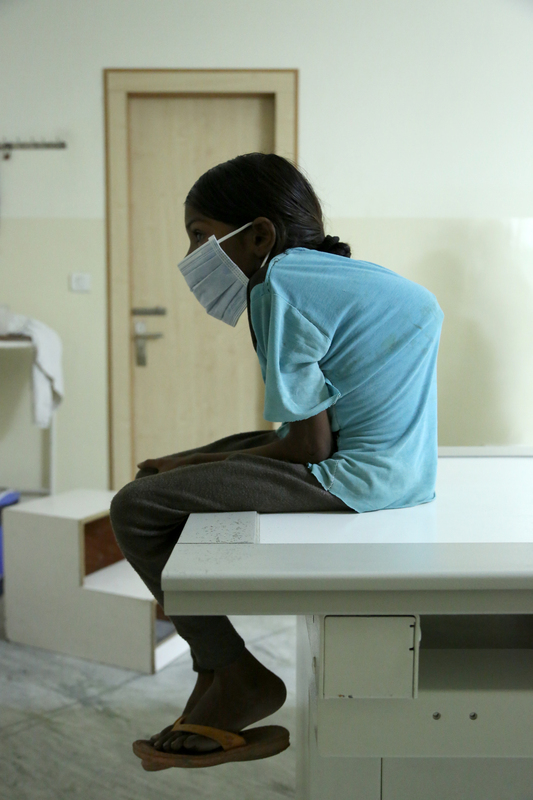 He had contacted a classmate of his from medical school who now worked at a government hospital in New Delhi and was able to treat Prianka for pennies on the dollar. To Delhi we went. 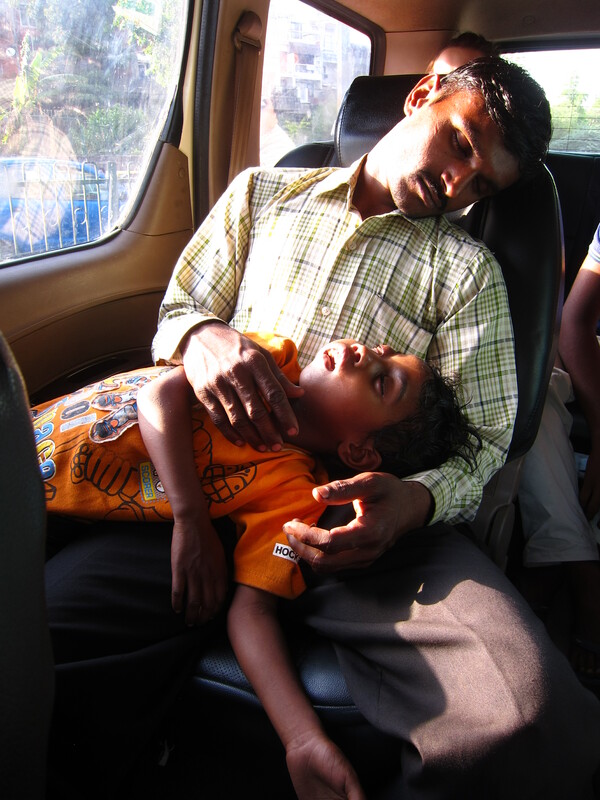 It was an hour long taxi ride to the hospital–$25 round trip. But it was a blessing compared to the $3,000 alternative. We took Manish, too, in case he would end up needing surgery as well. The doctors at the new hospital saw us immediately and we began to make valuable lasting relationships. More tests were ordered and, while we waited for the results to come back, I wanted to treat everyone to lunch. 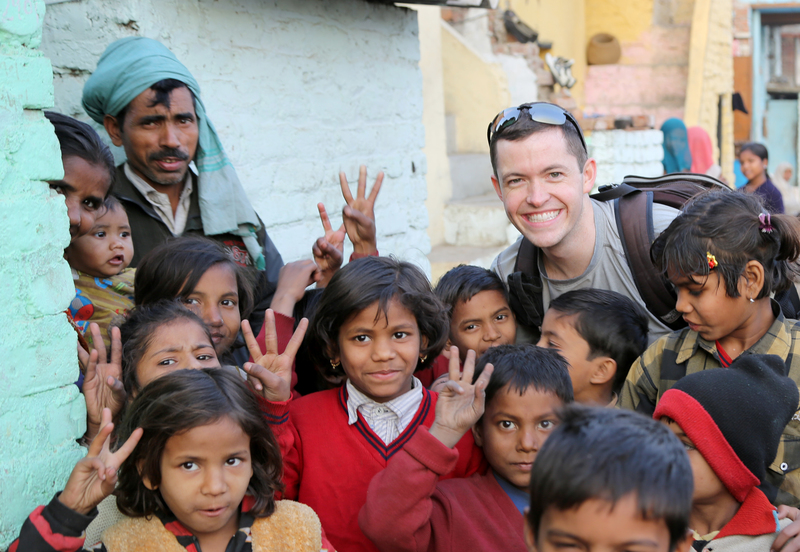 At this point, I didn’t have much time left in India. I wanted to make the most of it. We had passed by a fancy mall on the way to the hospital so I had the driver take us there. Then, I invited him to park the car and come with us too. 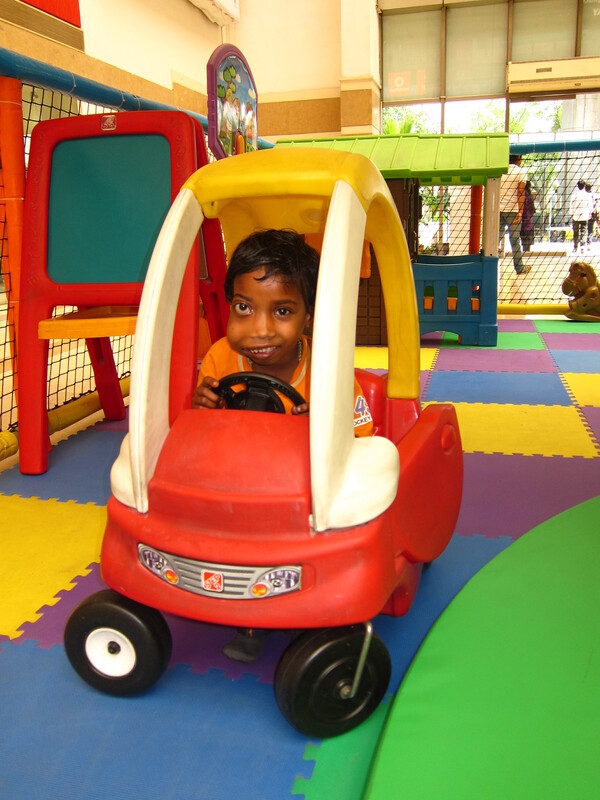 When we entered the massive air-conditioned building, it became obvious that this was a novel environment for the children and their families. 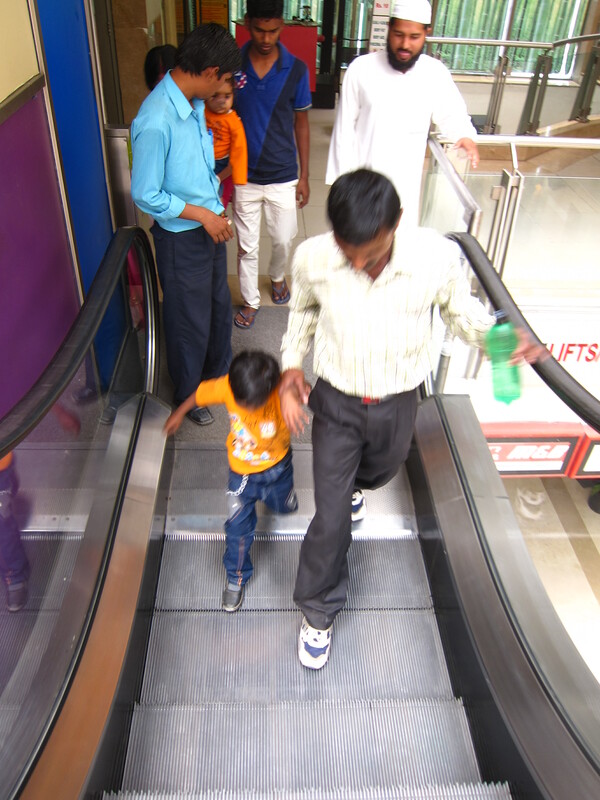 As we came to an escalator, Prianka and her father stopped. They stared at the moving pieces of metal wondering how to proceed. Then, they both took another step of faith as they fought for their balance. 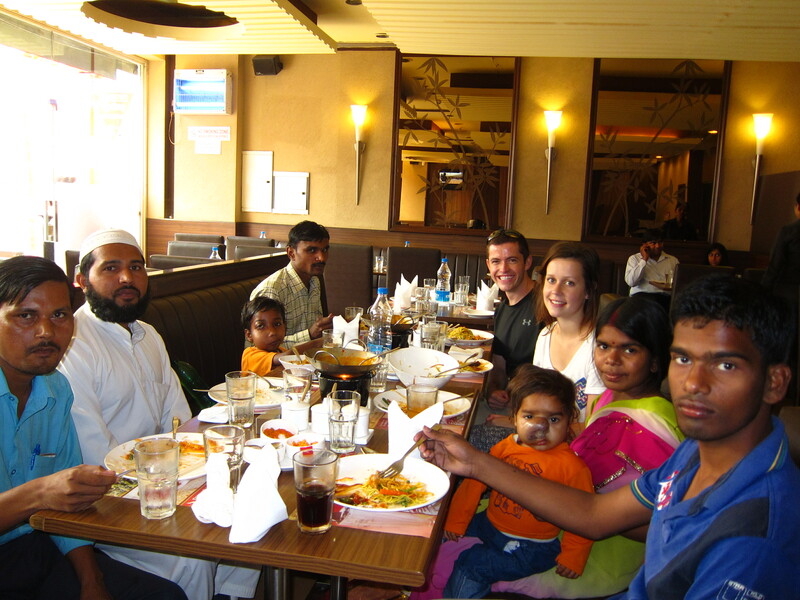 Here we were, one deformed boy and his Hindu family from the slum, one deformed girl and her Hindu father from a rural village in Bihar, a Muslim taxi diver, Jordan (a volunteer from Northern Ireland), and me, now shopping for a restaurant in a chic mall. Since the event was already a melting pot of beliefs, backgrounds, and lifestyles, I decided that Chinese food would be the suitable choice. As one might expect, most of the people in our party had never had Chinese food before. It was a day of “firsts” for everyone, including the staff and patrons of the restaurant. 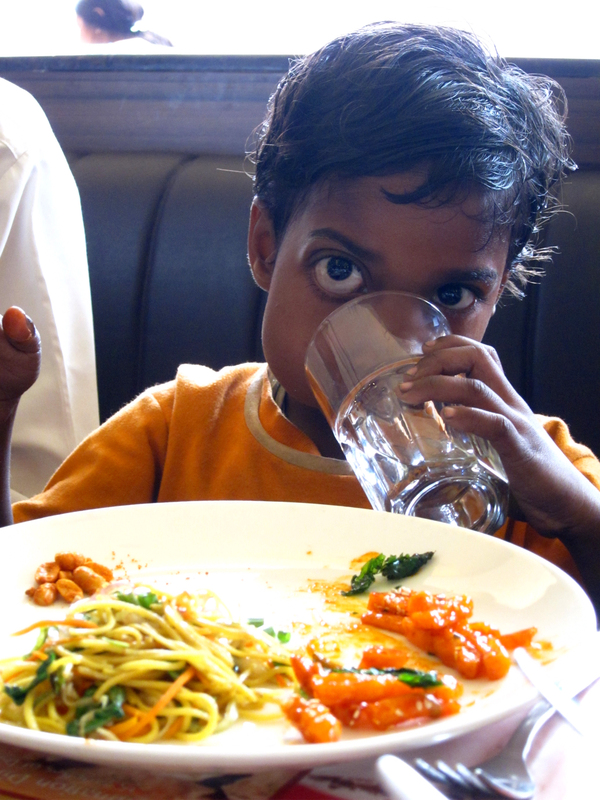 I had no idea what to order and neither did they; so, we just ate what was brought to us. Prianka dug into the noodles and chili fries with her hands, as is custom for her. She was much more at ease than her father, who seemed more worried about fitting in with the environment than she did. Everyone seemed to enjoy their meal, but I could not help wondering what was going through their minds. What were they thinking? Why was I giving them this meal that would likely be the most lavish of their entire lives? Why did I invite the driver to come with us? Why did I even pay attention to these overlooked children? What was going on? Who is this guy? What did they think that I was thinking? Did they think that I was thinking about what they were thinking? We may not be able to talk to one another, but that does not mean we cannot communicate. The most powerful form of communication is a genuine smile; and there were plenty of those to go around. To these children, going to a restaurant, riding an escalator, and sitting in a toy car were like a once-in-a-lifetime trip to Disneyland. The fun was perhaps a bit overwhelming and certainly exhausting. 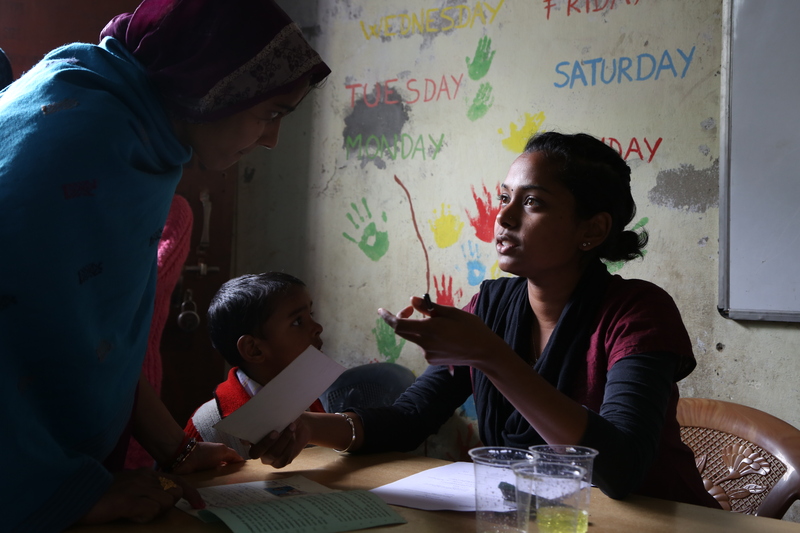 With lab results and procedure schedules in hand, we made the hour-long drive back to the slum. 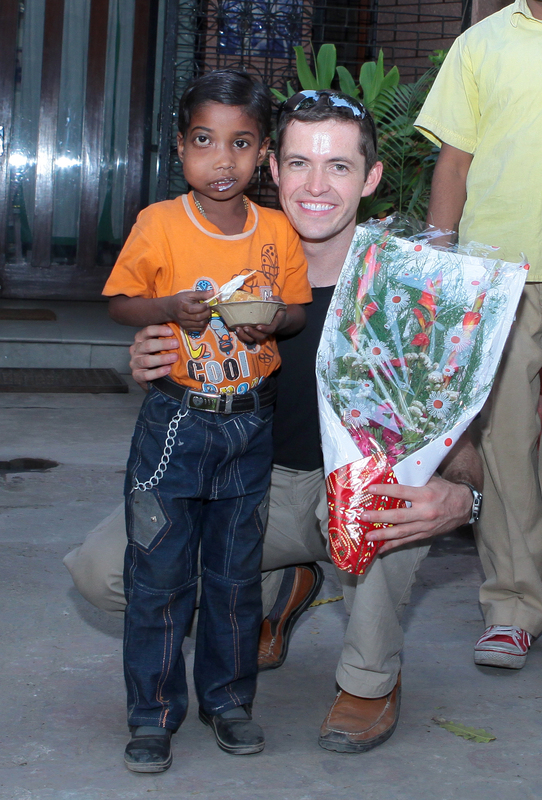 Only one week later, I had to leave India to return home. At my farewell party, Prianka and her father gave me a bouquet of flowers. I vowed that I would continue to care for her, even from afar. 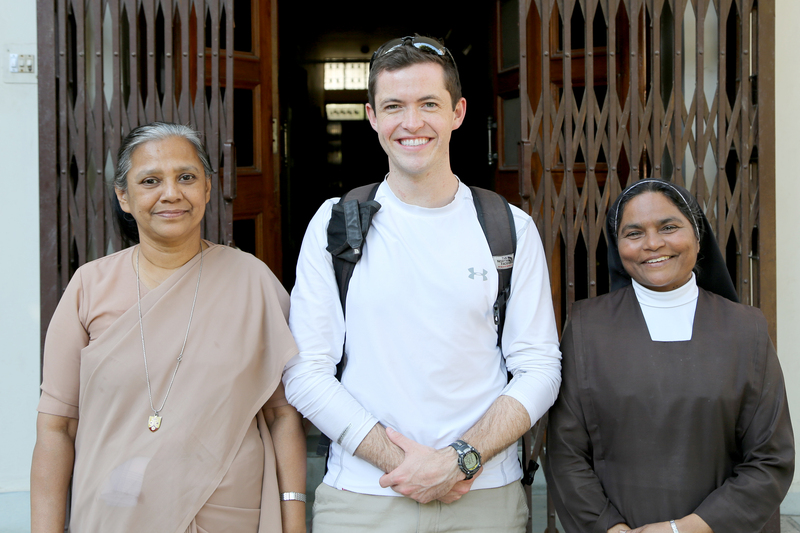 From the United States, I continue to stay in touch with Mithlesh, Mamta, and the Sisters in the Carmel Convent School nearly every day. 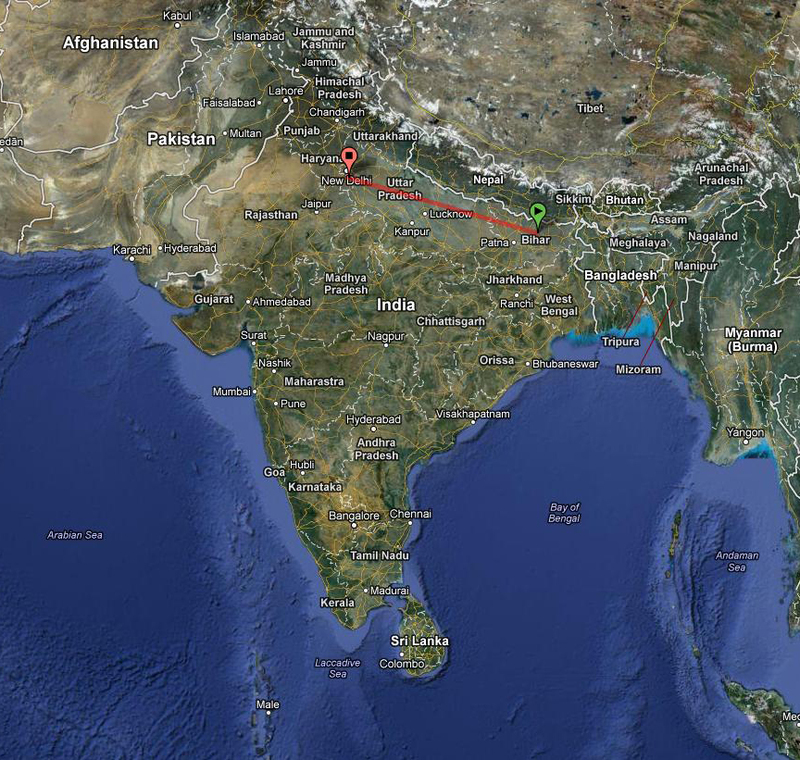 Even though I am 8,000 miles away, I have not lost my attachment and commitment to our students, patients, and friends. We feel like family now, and that has powerful implications. 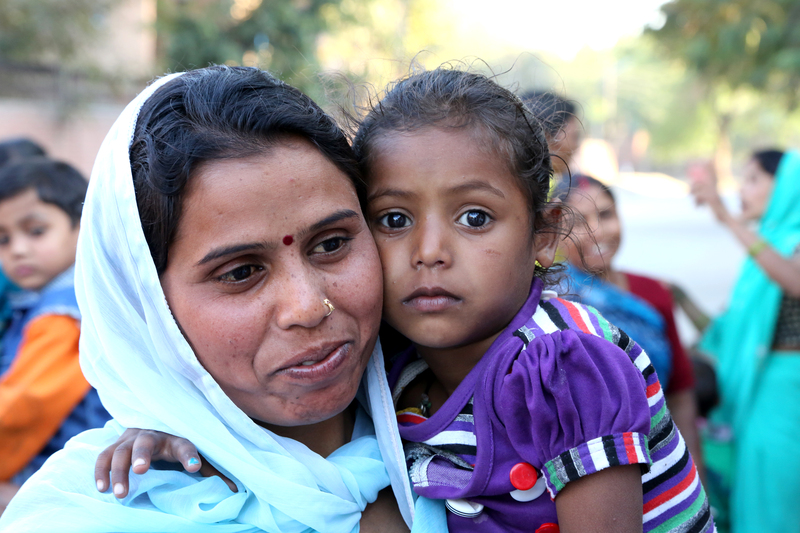 Mithlesh and Mamta have worked incredibly hard over the past few months. They promised to carry on what we started, and they have. We owe them tremendous thanks. The first positive news came back in late May after Prianka’s tissue biopsy was found to be negative for cancer. For Prianka and her family, this was news worth celebrating. This meant that we would proceed toward an operation. 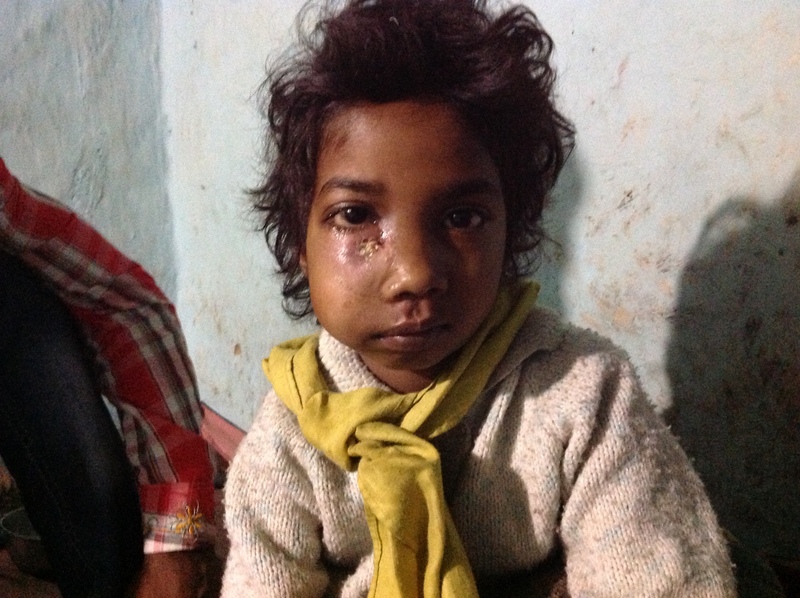 Mamta and Mithlesh spent many days going back and forth to the hospitals with Prianka and her father. 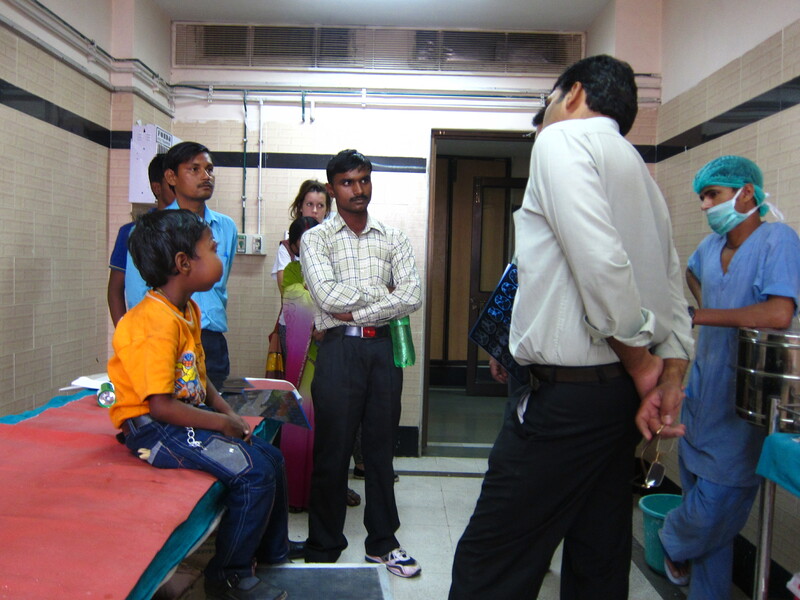 Unlike in America, the patient has to do most of the work in India. You keep your own records, get your own tests (each in separate locations), and then even have to pick up your own test results in person and take them to separate doctors at specific times and specific locations. To further complicate matters, some hospitals do not recognize or use tests from other hospitals and so they must be performed again. There are no maps or phone numbers to call for assistance. Life is all about dead reckoning. 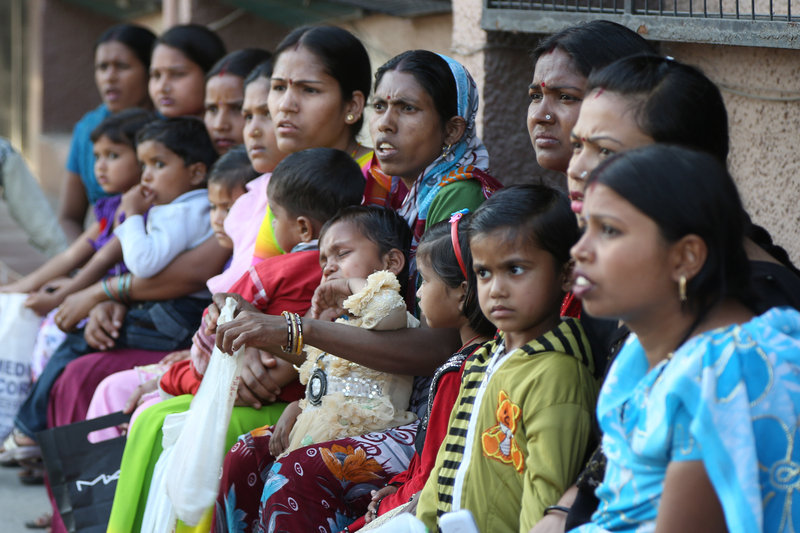 Needless to say, the Indian healthcare system requires extraordinary patience and determination. Luckily for Prianka, she found people with those traits to help her. 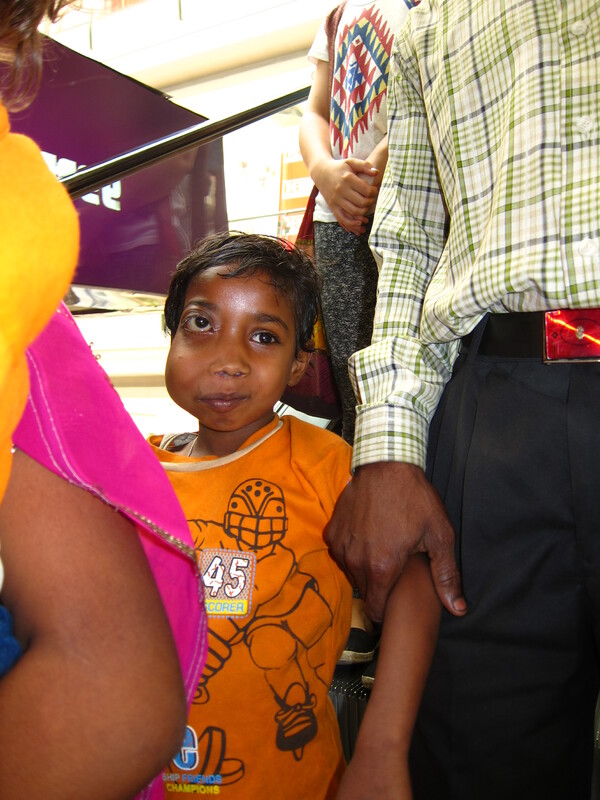 On June 12, Prianka was taken into the operating room under the care of Dr. Anurag Jain, Plastic Surgeon. The complex operation took 5 surgeons more than 5 and a half hours to conduct. Dr. Anurag’s assistants took pictures for me throughout the procedure. I have contemplated posting them but, quite honestly, they are graphic beyond description. Some day, Prianka might read this blog post and I would not want her to be frightened by the pictures of herself with half of her face missing. 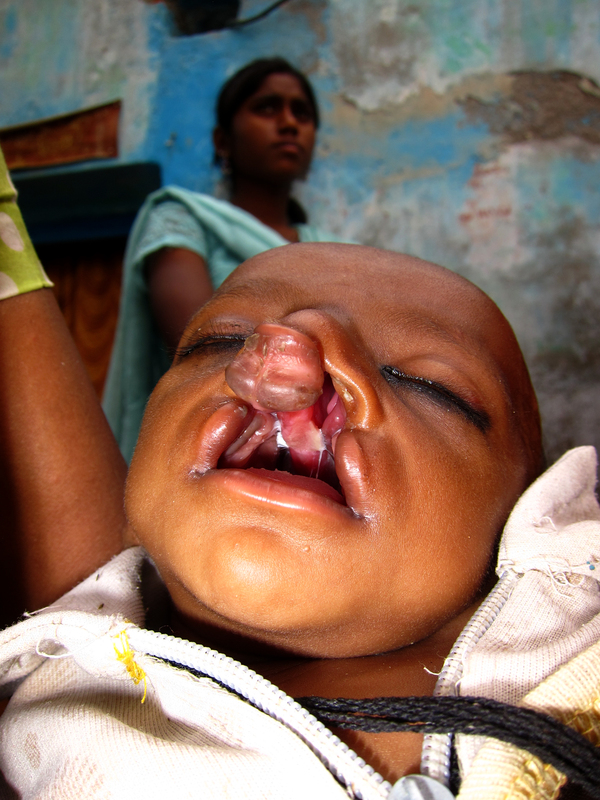 Just know one thing: what Dr. Anurag and his team did was extraordinary. 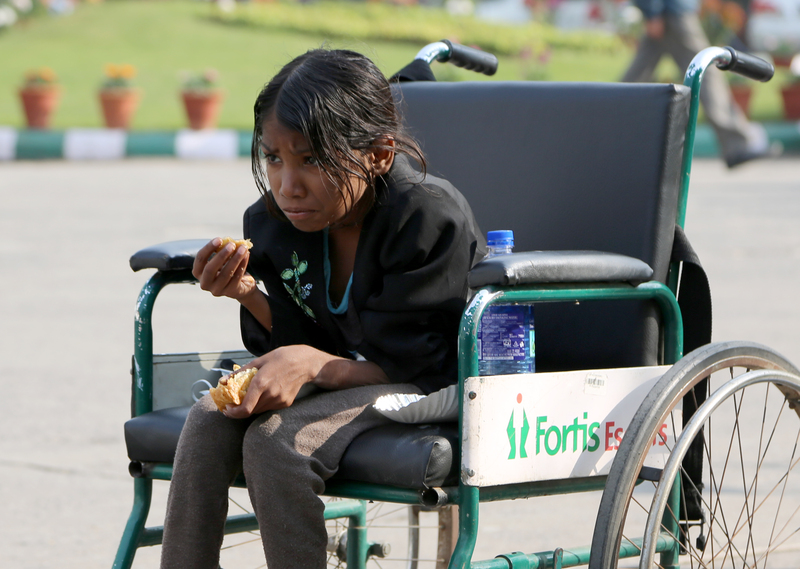 Ten days later, Prianka was discharged from the hospital. 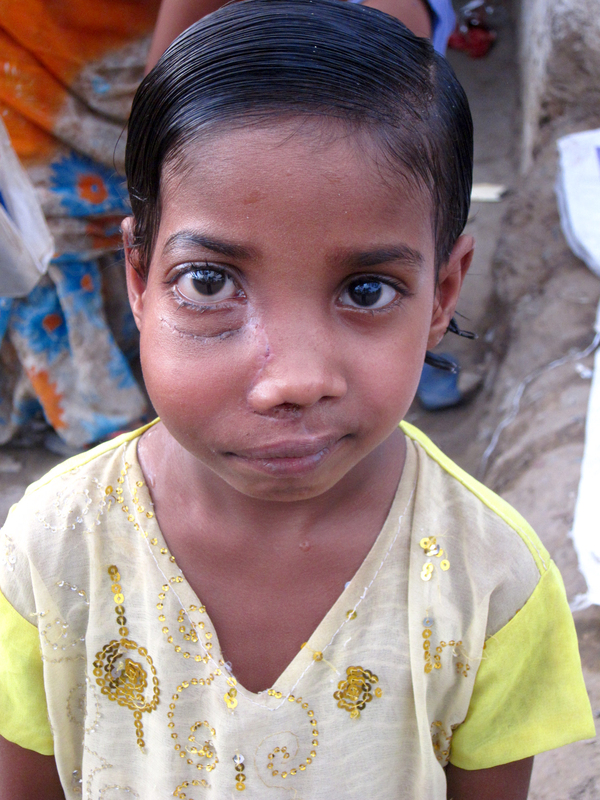 She returned to the slum with perfect vision and healing face that was still decreasing in size as the swelling dissipated. Prianka and Rajesh then thanked everyone profusely for their support. They said their goodbyes and departed for the train station to begin their 600 mile journey home. To me, these pictures are among the most special that I own. They are of a girl who was beyond hope, who was facing almost certain blindness and perhaps worse, who displayed courage and took a chance. 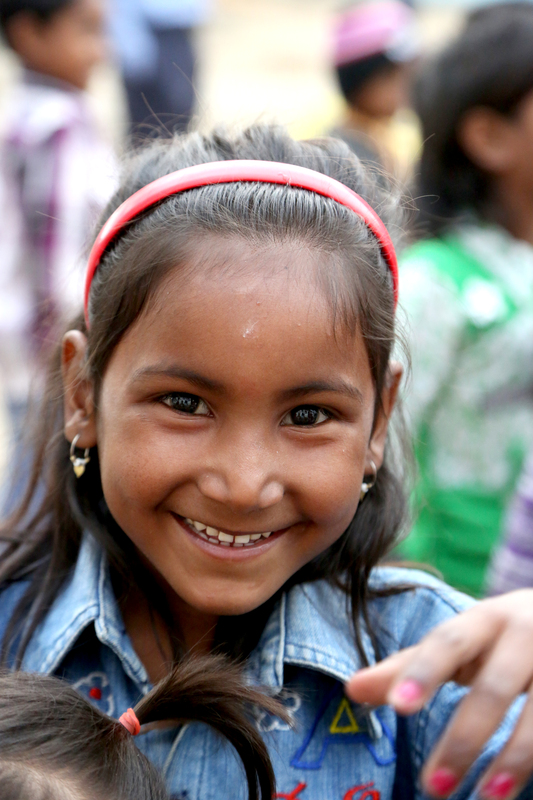 Prianka returned to her village on June 22. However, she still calls to keep in touch. 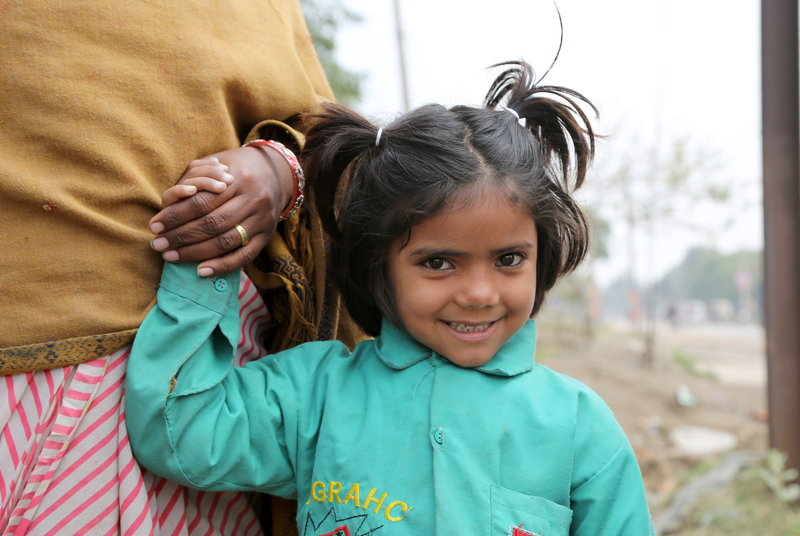 Last week, in late August, Mamta spoke to Prianka and her family. 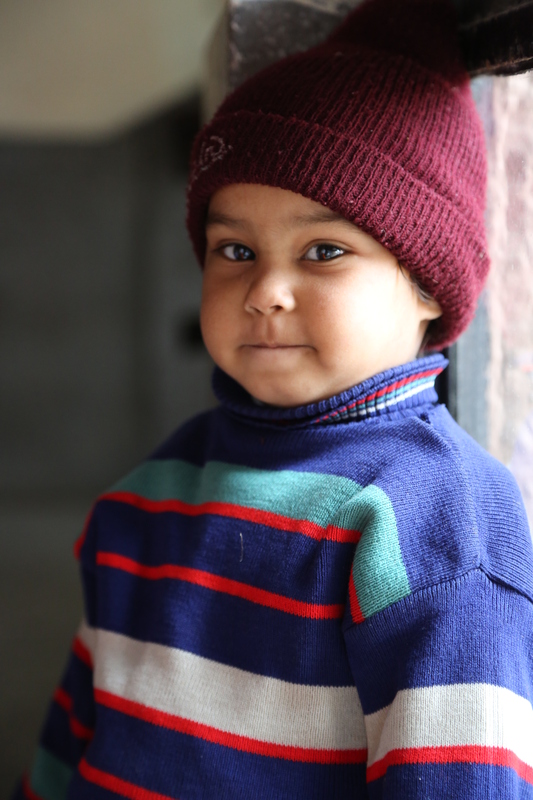 She says that Prianka was laughing and playing on the phone, that she had enrolled in school for the first time, and that she was looking and feeling much better. 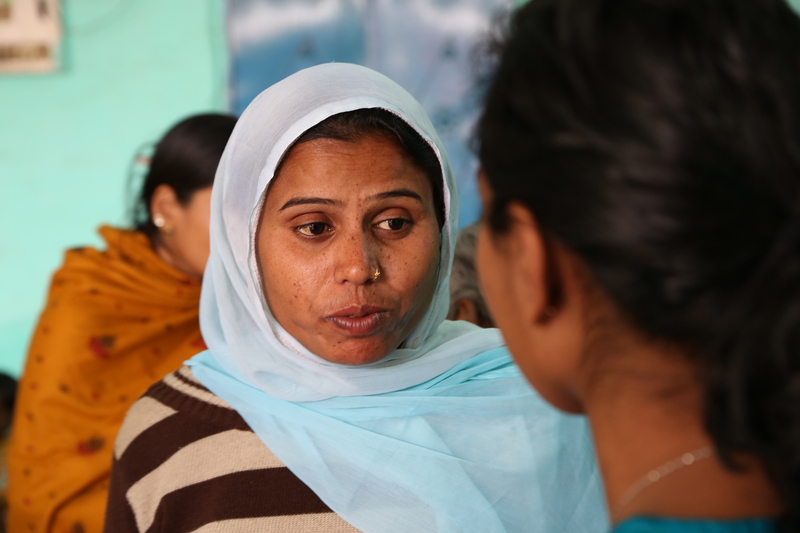 Rajesh and his wife also spoke to Mamta and they could not stop saying thank you to her, to the surgeons, and to us. 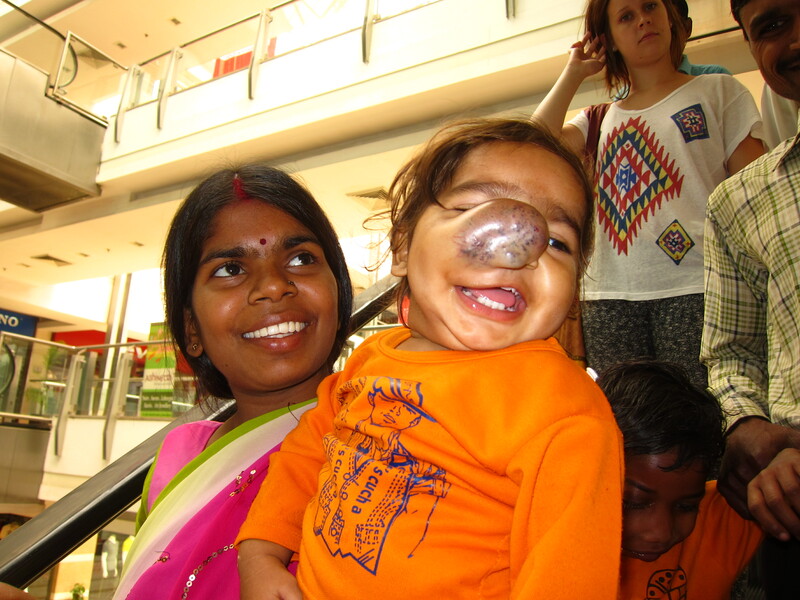 I would like to express my most heartfelt gratitude to the people who made Prianka’s life-changing story possible. 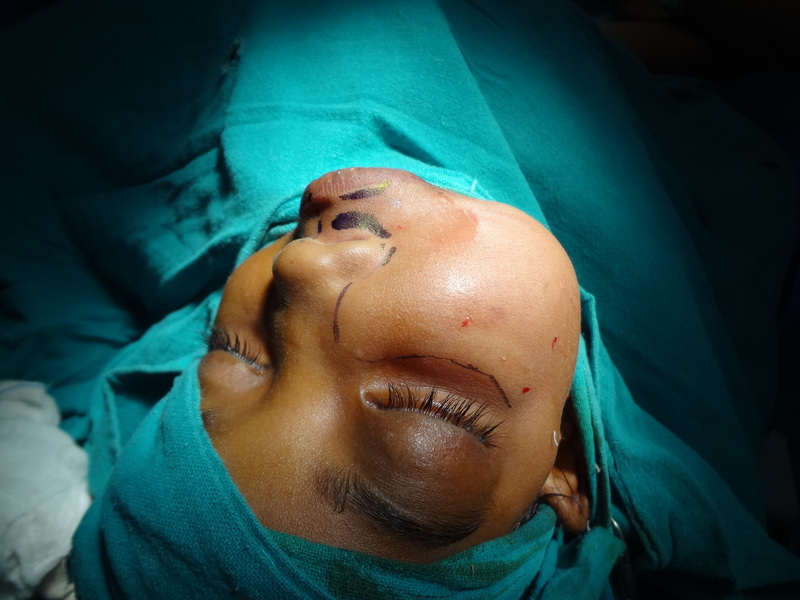 First, I must thank Dr. Anurag Jain for his many years of training and work to make a surgery like Prianka’s even an option. Dr. Amitabh Singh, without your help and guidance, we would never have found Dr. Anurag or been able to receive such tremendous care at your hospital. 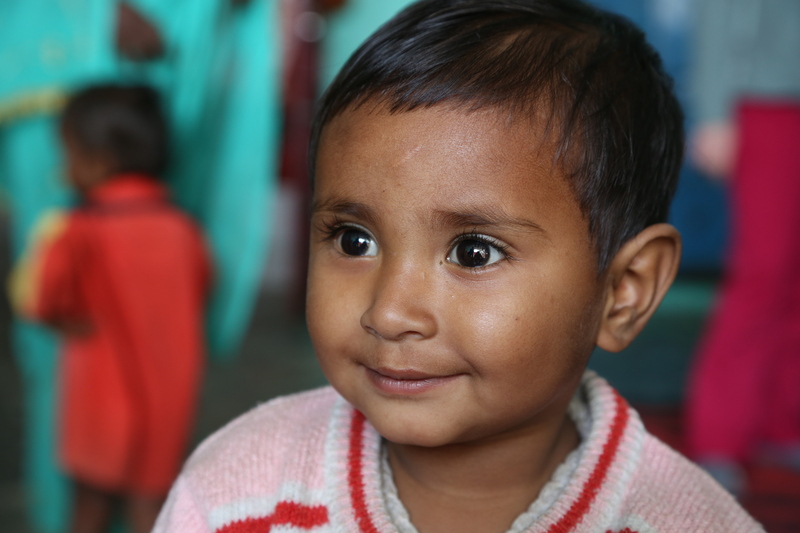 Mamta and Mithlesh, thank you so much for taking Prianka to the hospital on those many long days, standing in queues for hours on end in scorching summer heat, and volunteering your time for this precious little girl whom we only met a few months ago. Lastly, I would like to thank my parents, Joseph and Mary Schupbach. 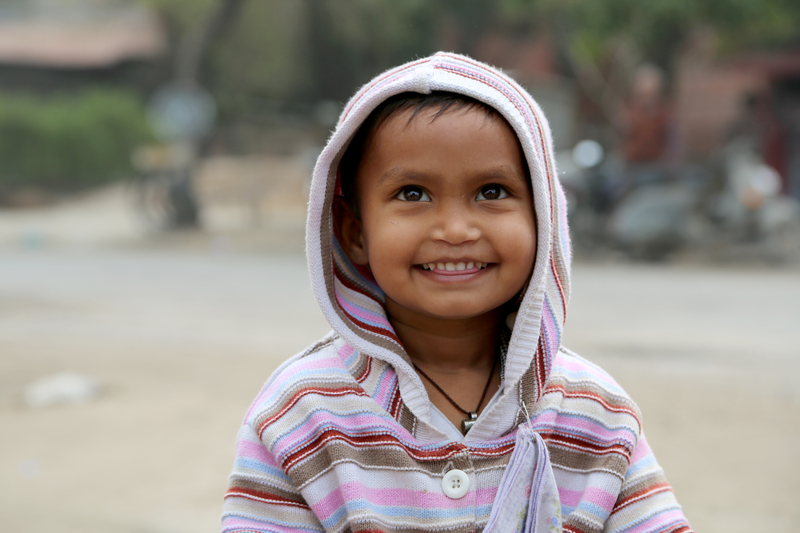 They funded Prianka’s entire medical care, from the tuk-tuk and taxi rides to the hospital to the expensive CT scans to her medications post-operation. Without funding, none of this would have been possible. 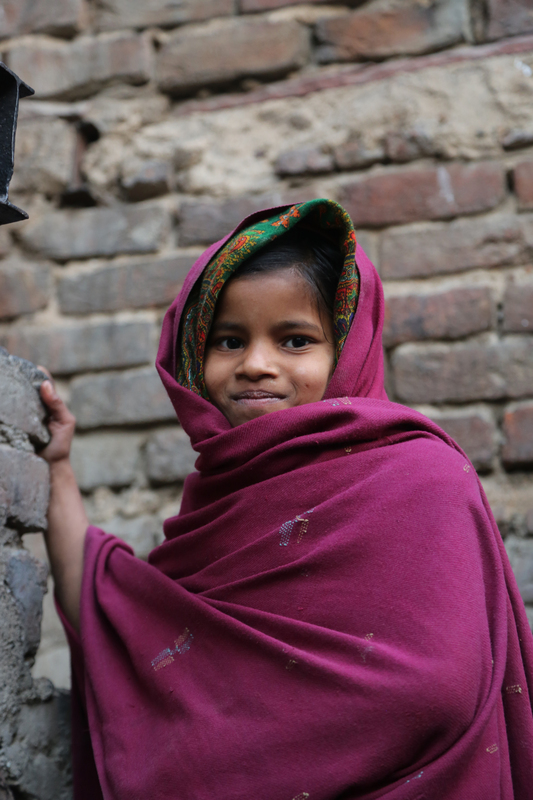 Overall, the $550 you allocated to Prianka’s healthcare has changed her life forever and mine as well. Thank you! I love you. Prianka’s was the first operation funded by Healing the Hidden. However, it is far from the last. 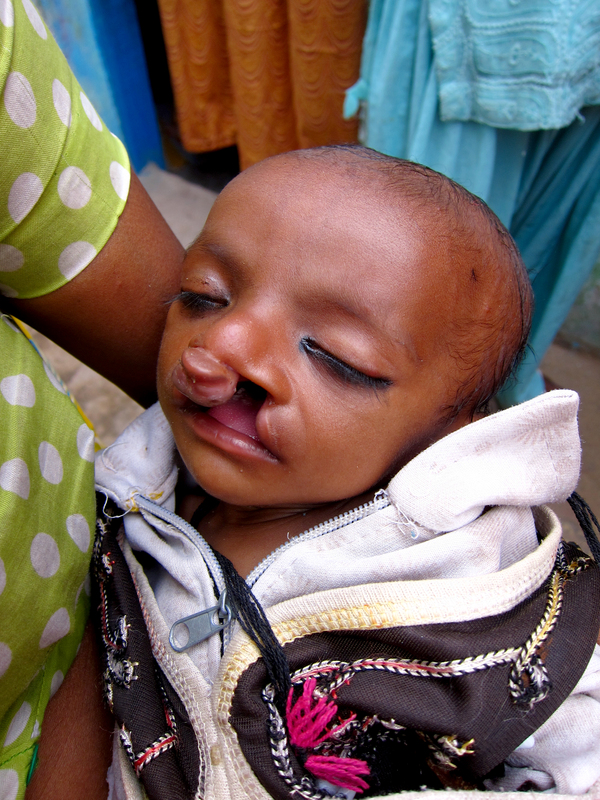 Santosh received his bilateral cleft lip surgery on Tuesday of this week. He is recovering at the hospital in Delhi as I write. 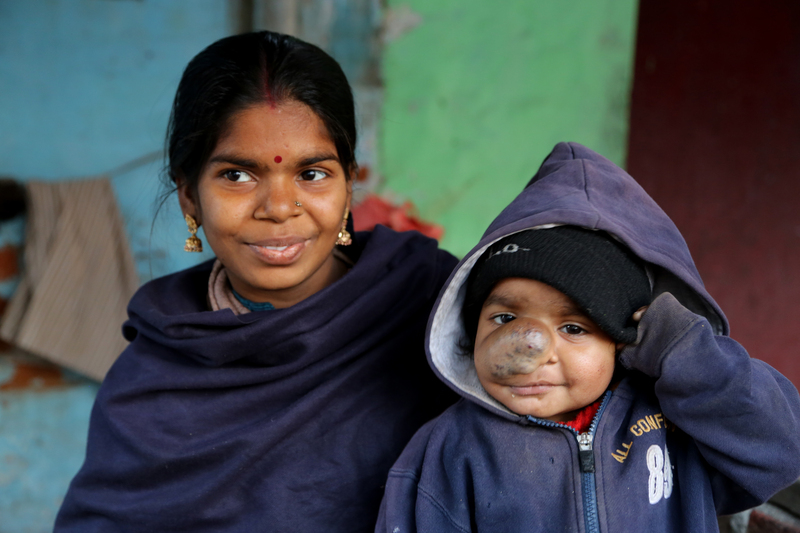 Please keep him in your prayers and, if you have been inspired by Prianka’s story, please take a moment and donate 5 DOLLARS to Healing the Hidden for Santosh. 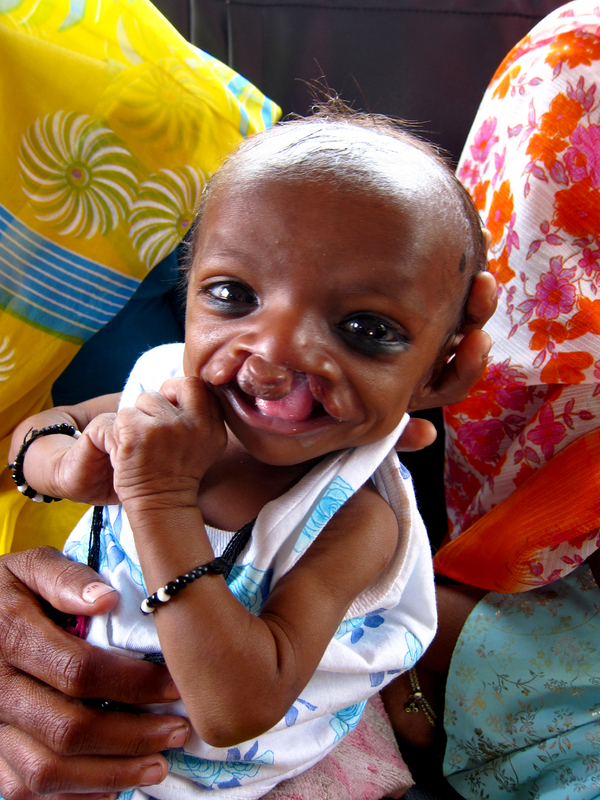 Let’s join hands and help Santosh with his precious smile. It’s a smile worth $5. 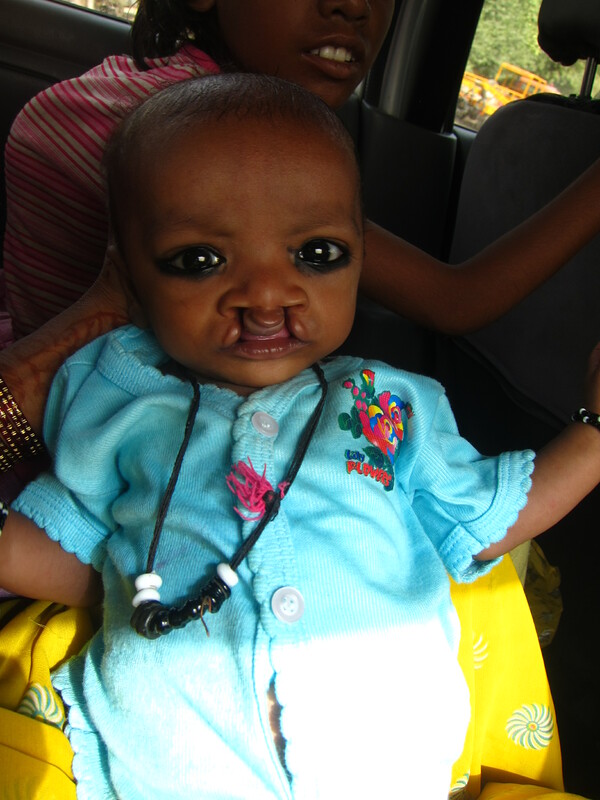 …April 3, 2012: This morning, a mother named Sugo Devi brought her deformed infant boy to the slum school for help. This is the first time someone needing medical attention has actively come to us for assistance and marks a radical shift in our ability to provide care to this community. 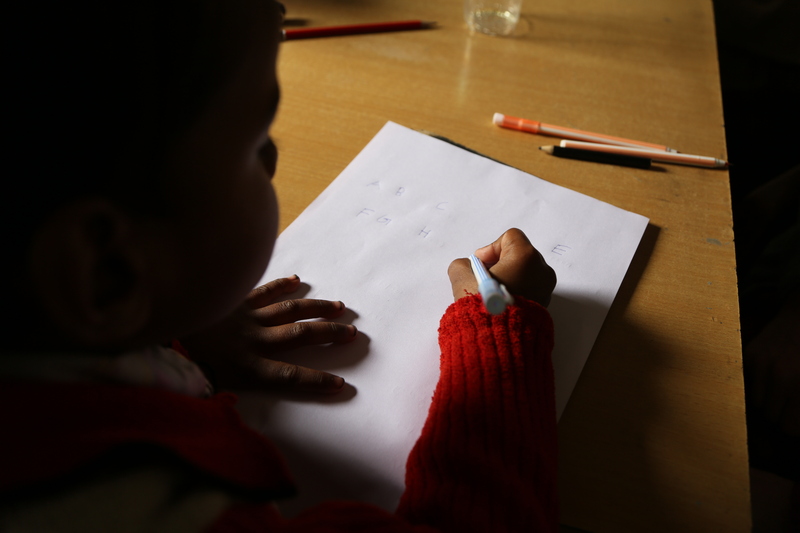 Parents of deformed children here have traditionally not sought help from others partially because of the negative stigma involved with having disfigured or handicapped children. 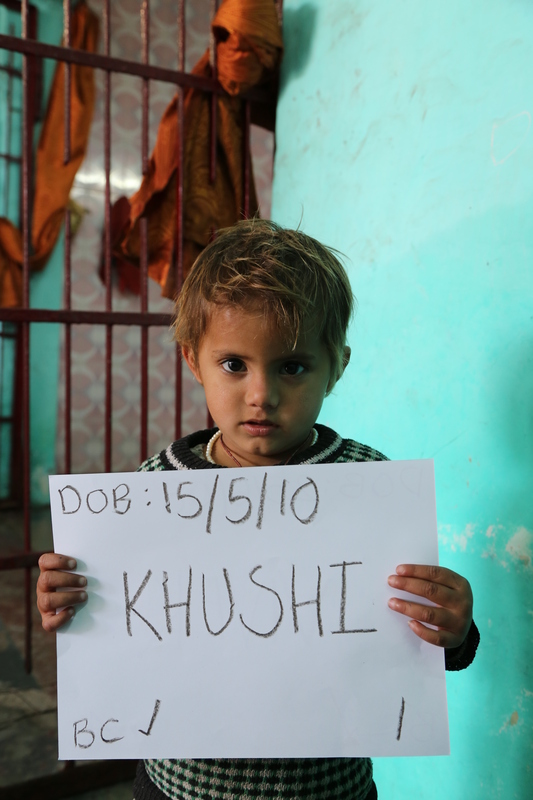 Manish’s mother, for instance, turned away from me shamefully the first time I saw her holding him. 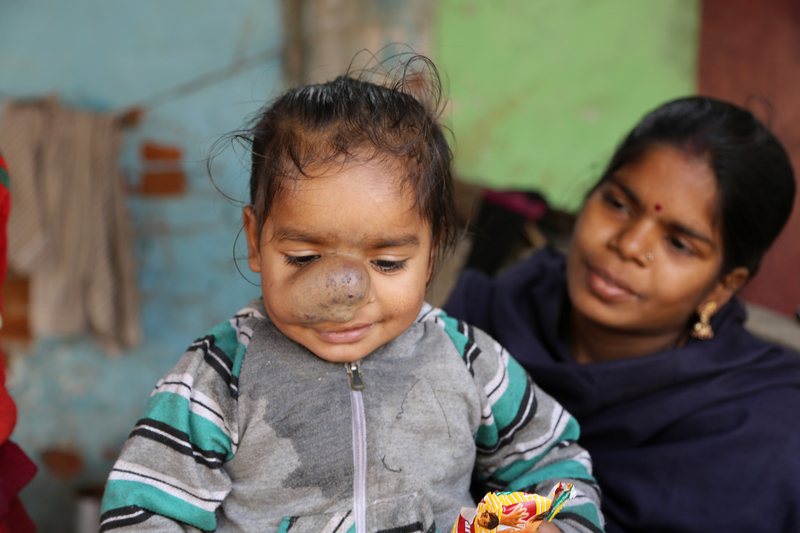 Moni, even by age 5, had never been to a doctor to have her cleft lip and palate examined. Even the young “normal” children, the least likely to judge others based on appearance, originally refused to play with handicapped or mentally challenged children. The fact that Sugo Devi showed up this morning proves that the purpose of our work is being noticed and understood far beyond our direct area of impact. 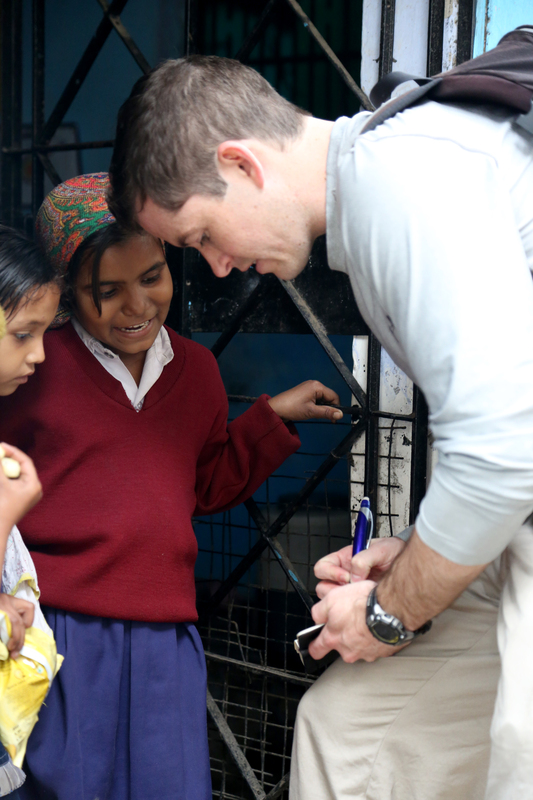 The slum residents are beginning to trust us enough to overlook social barriers, which is a huge step in the right direction. 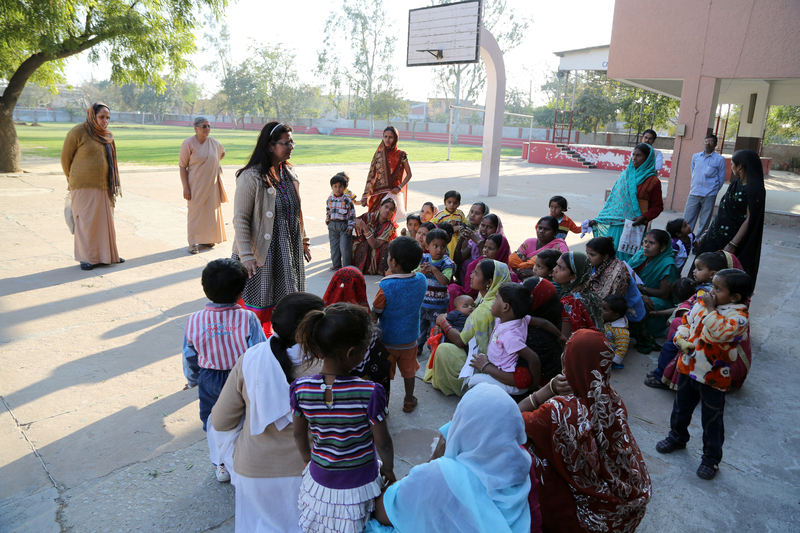 I wasn’t in the slum when Sugo Devi showed up this morning, so the volunteers who were there told her to come back to the slum school at 5pm. 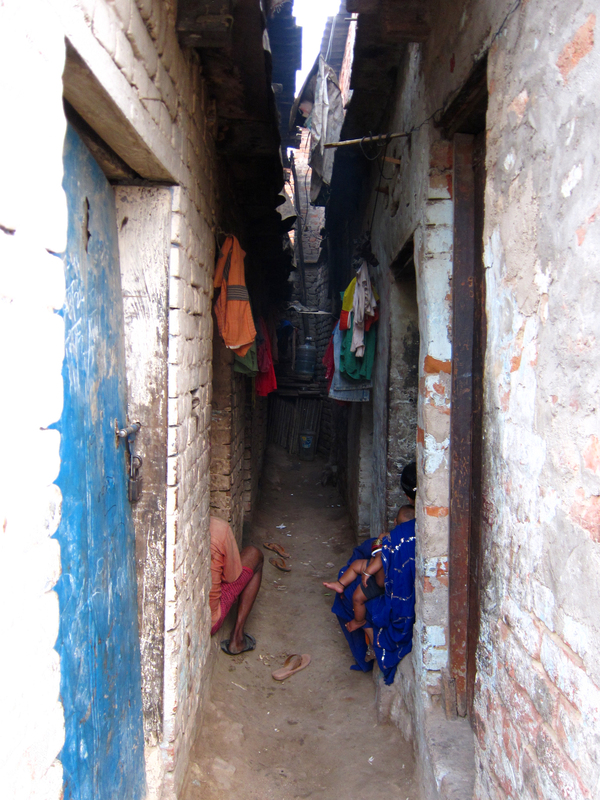 When class ended at the Carmel Convent School at 5pm, Heather, Natalie, Merril, Win, and I ventured into the slum. 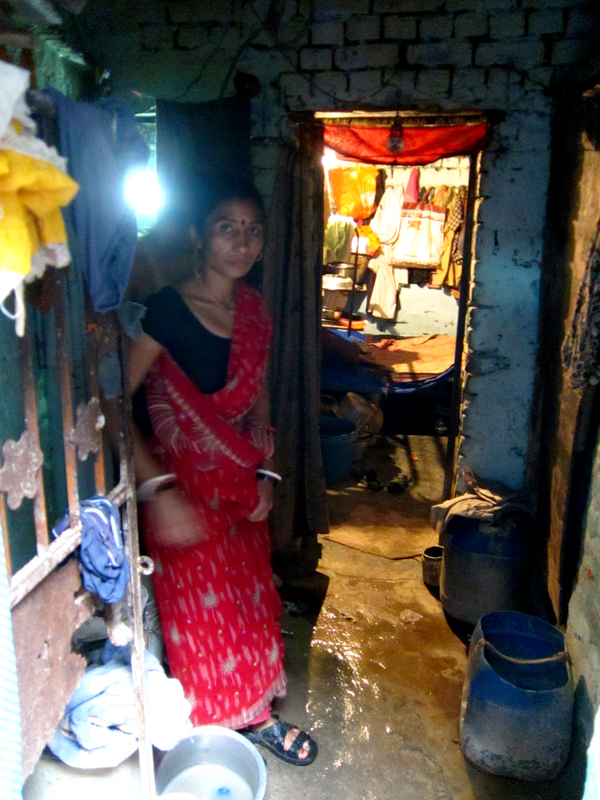 Sugo Devi was waiting for us in the shade of a slum home with her infant shielded from the judgmental eyes of others. We greeted her and introduced ourselves. 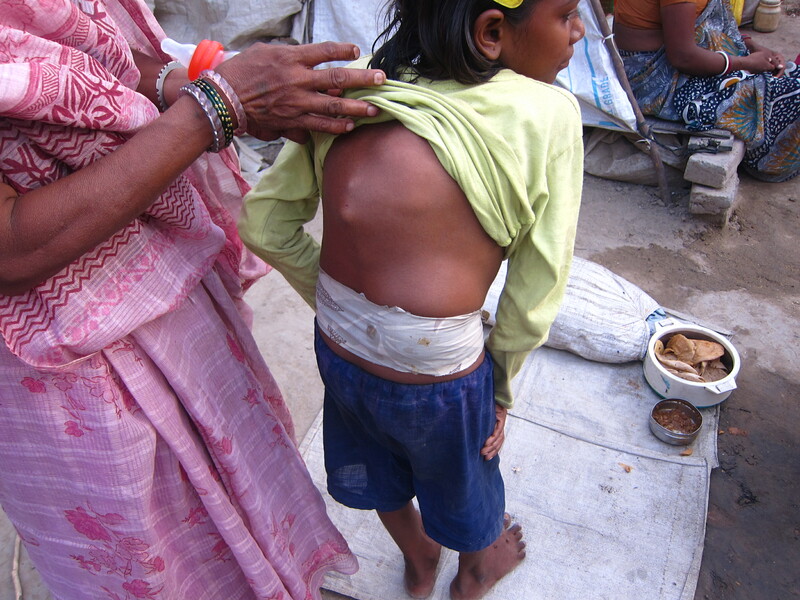 Then Sugo Devi unwrapped her little boy from the excess fabric of her Sari. 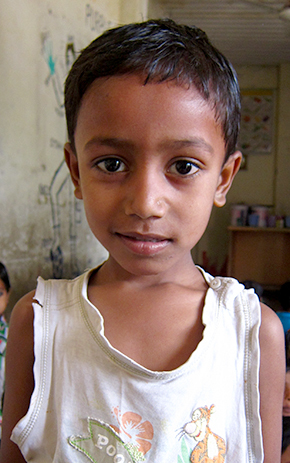 The little boy, named Santosh, was shocking. 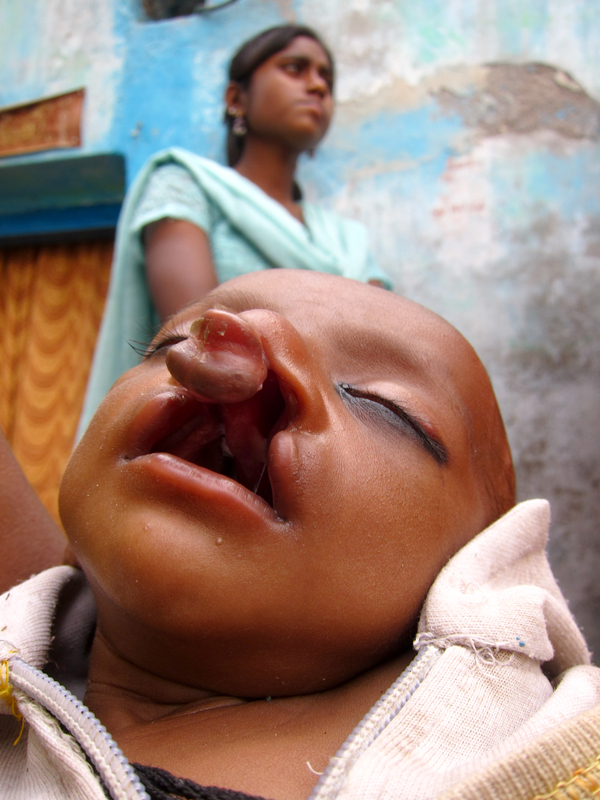 No one present had ever seen such a severe cleft lip and palate. 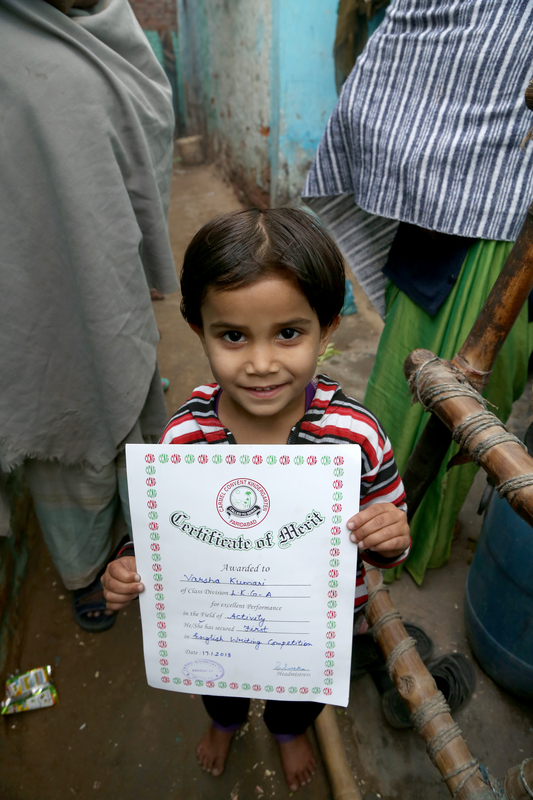 As I gathered information for the surgeons, I was stunned to learn that Santosh was born on December 23, 2011 right here in the slum. I was likely within just a few hundred meters while she was in labor! 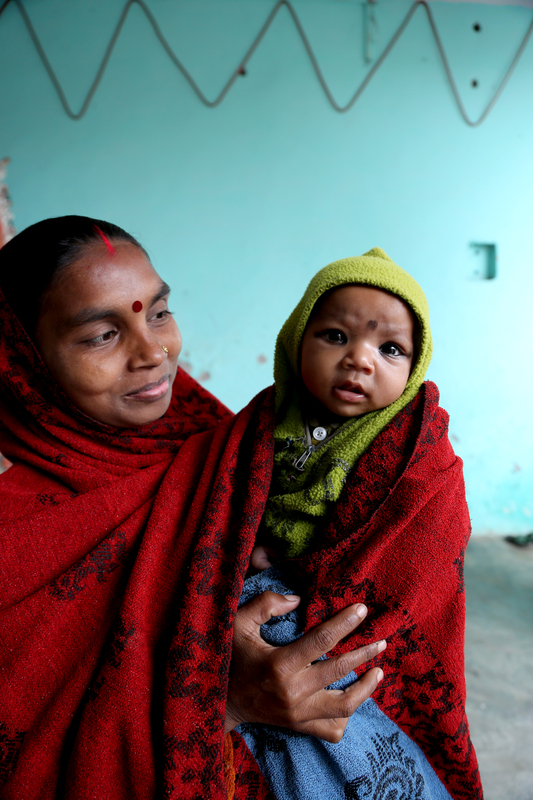 For three months of age, Santosh is small. However, I told Sugo Devi that we will take her and Santosh to see the plastic surgeon in Delhi on Monday when we take Moni for her appointment. 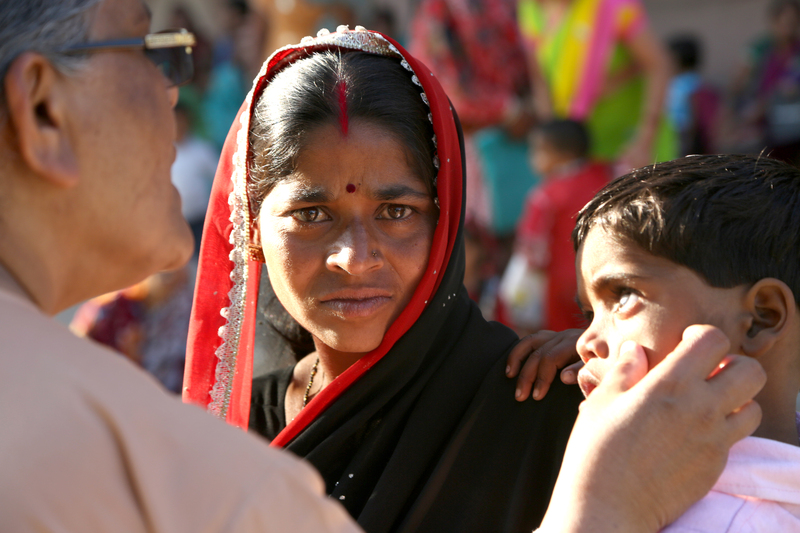 Sugo Devi looked grateful, wobbled her head, wrapped Santosh back up in her sari, and carried him back toward their home upstream. Sugo Devi’s arrival is inspiring. Within the past few weeks, I have coincidentally stumbled upon three children in desperate need of medical attention. We have taken all of them to hospitals and found surgeons who are so inspired by our efforts that they volunteer their time to help us. 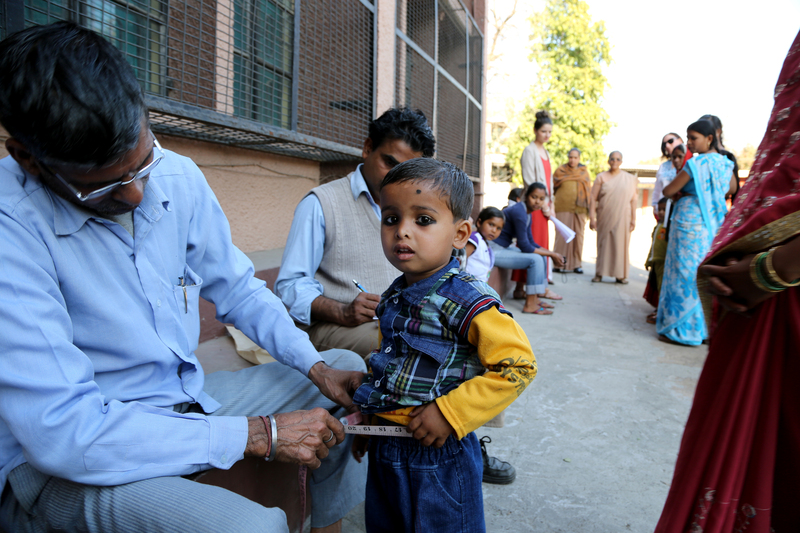 Now, other ailing families are starting to seek our help. It was evident this afternoon that we needed to upgrade our plan of attack. 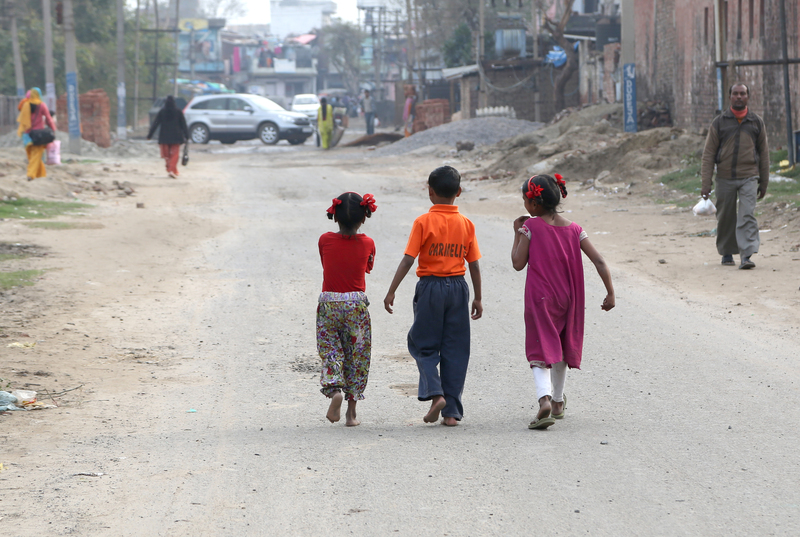 Win, Mithlesh, and I immediately set out on a search and rescue style hunt through Patel Nagar for more children we could help. We decided to follow Sugo Devi’s route. 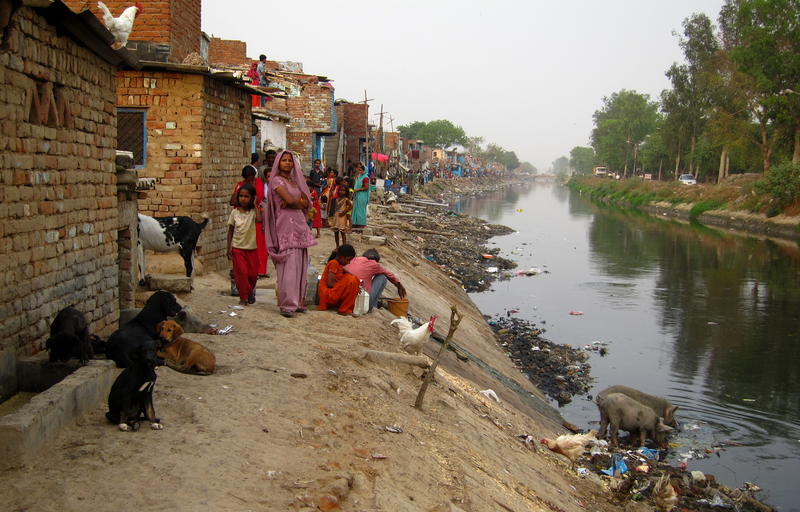 With eyes peeled for deformed and handicapped children, we set out upstream. 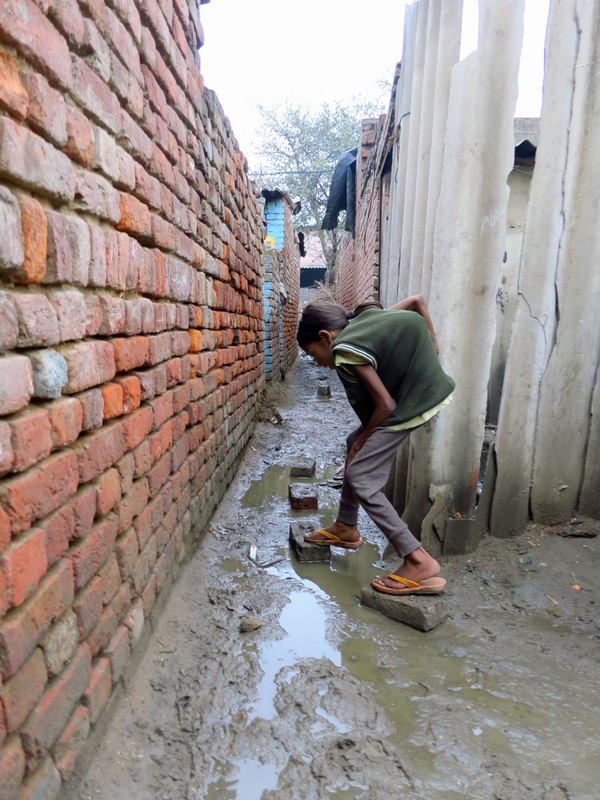 In just over 90 minutes, we passed within 50 meters of the homes of more than 25,000 people. 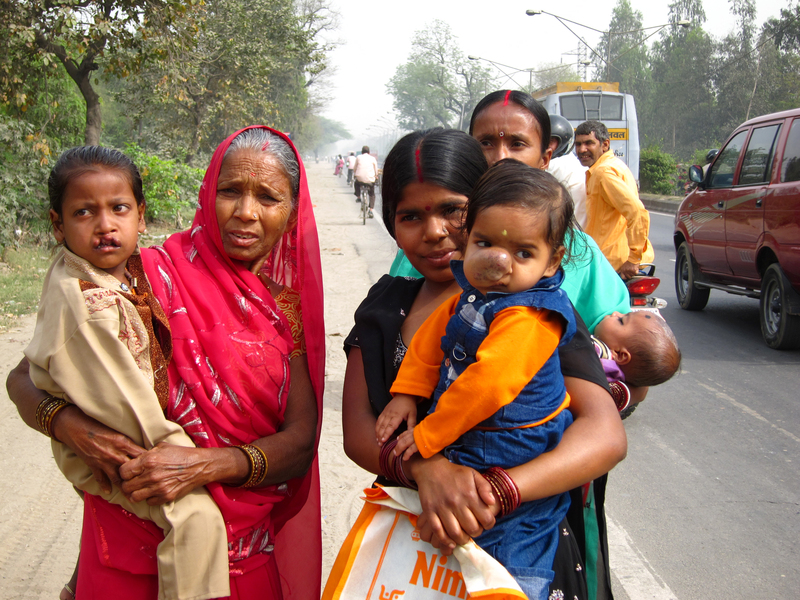 We stopped every 50 meters or so and asked the residents if they had seen any children who need medical attention, especially for anyone with cleft lips or palates. 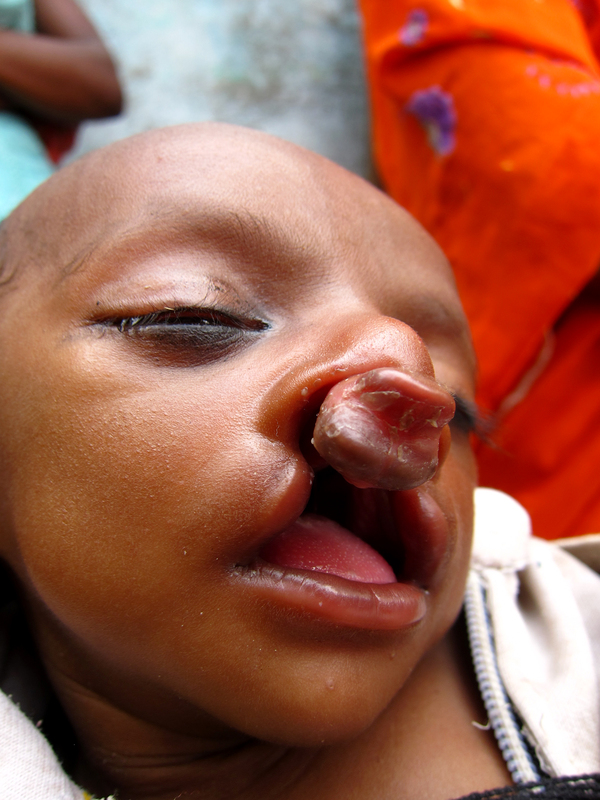 We found several children with uncorrectable birth defects, retardation, down syndrome, and/or polio. 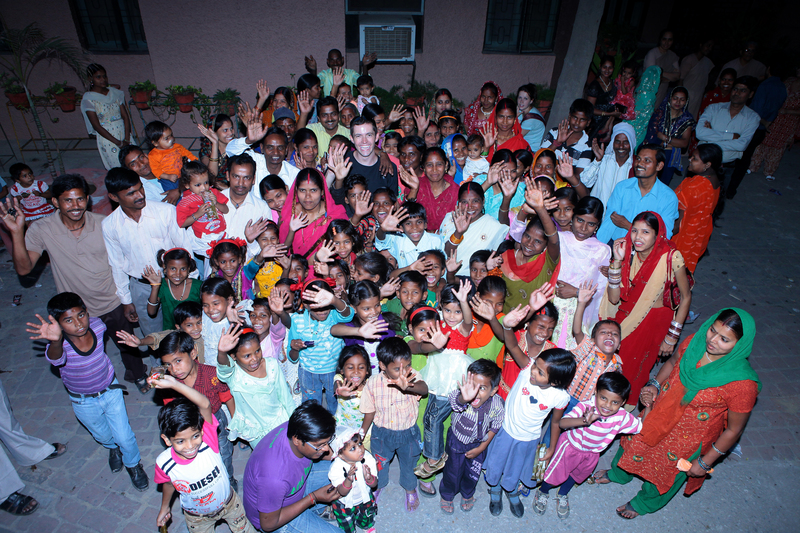 However, there were few children that we could drastically improve through medicine. 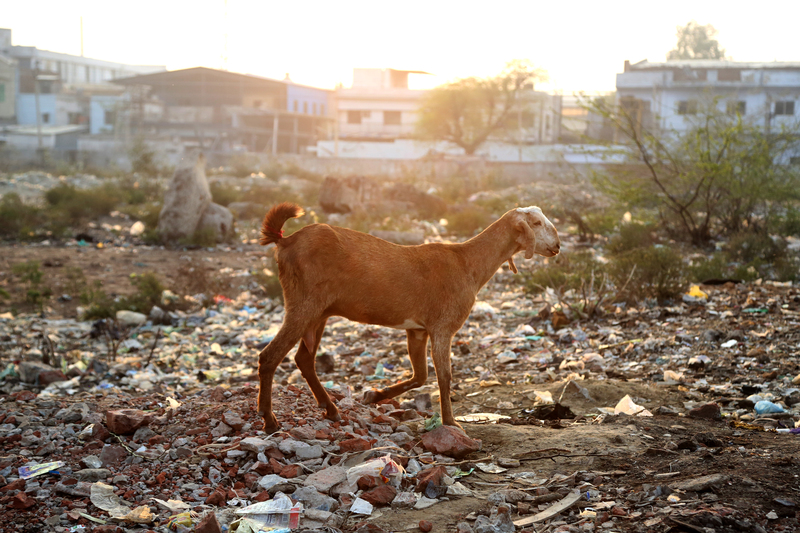 We searched in nooks and crannies, through the rubble of slum homes destroyed by the government, and past enough livestock to start a farm. 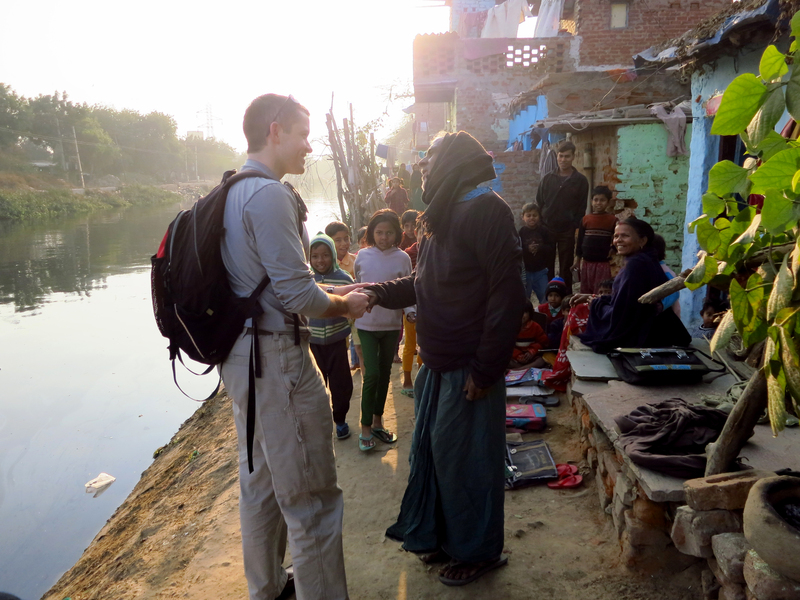 We were eventually led by a vigilant resident straight to Santosh and his mother. 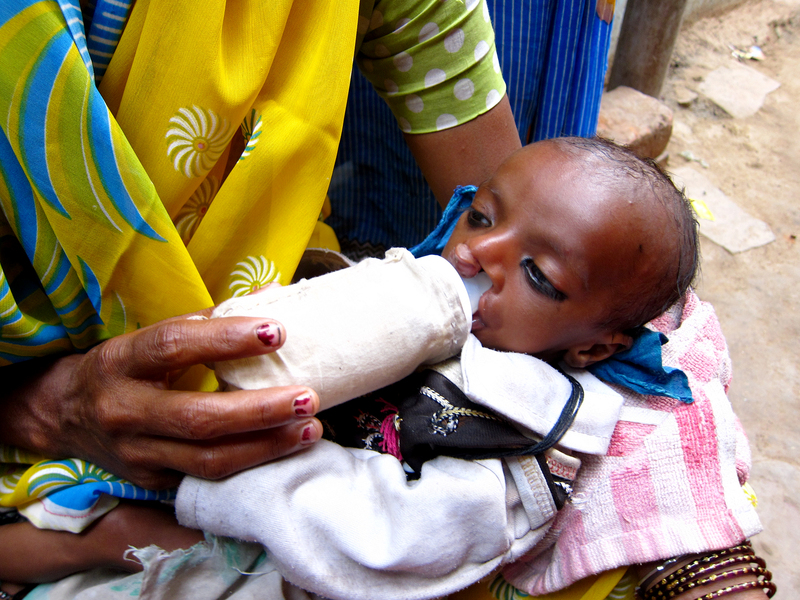 Santosh was attempting to sip milk from a bottle in his mothers arms outside of their home. 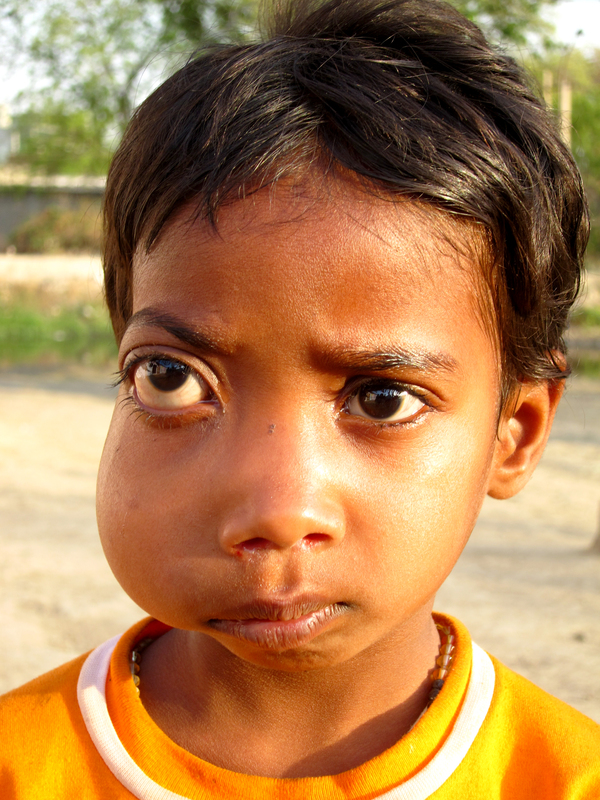 Santosh cannot create suction, so his mother had unique ways to manipulate the milk into his mouth. What I saw next, however, is what made my jaw hit the floor. 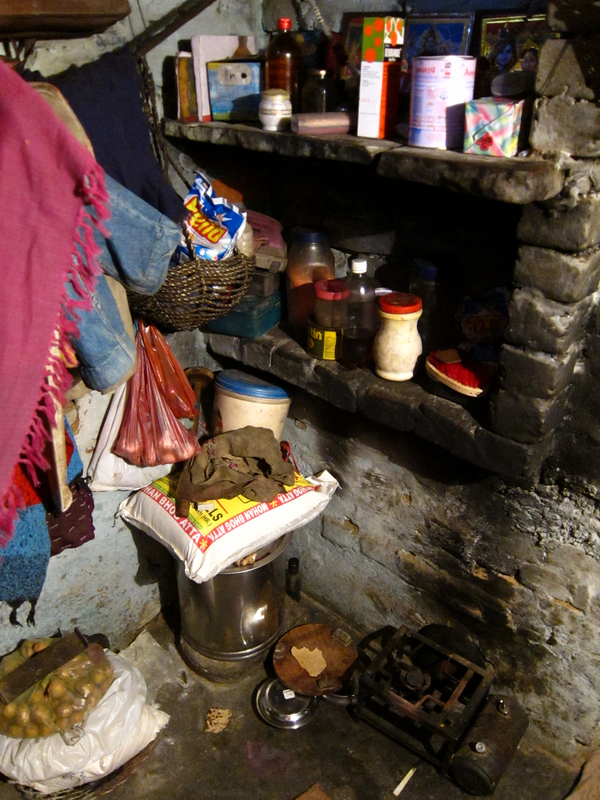 With permission, I walked into Sugo Devi’s home. 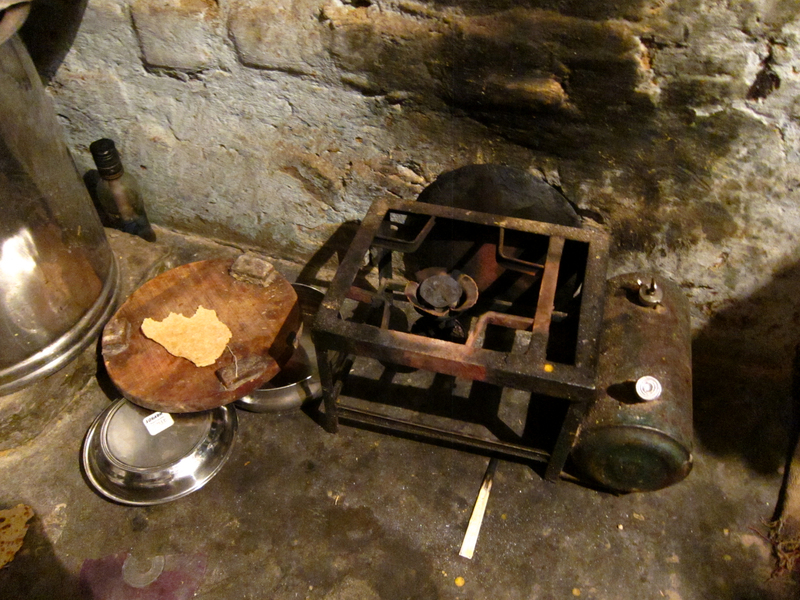 As I did, I learned that six people live in this tiny room about the size of my bathroom at home. 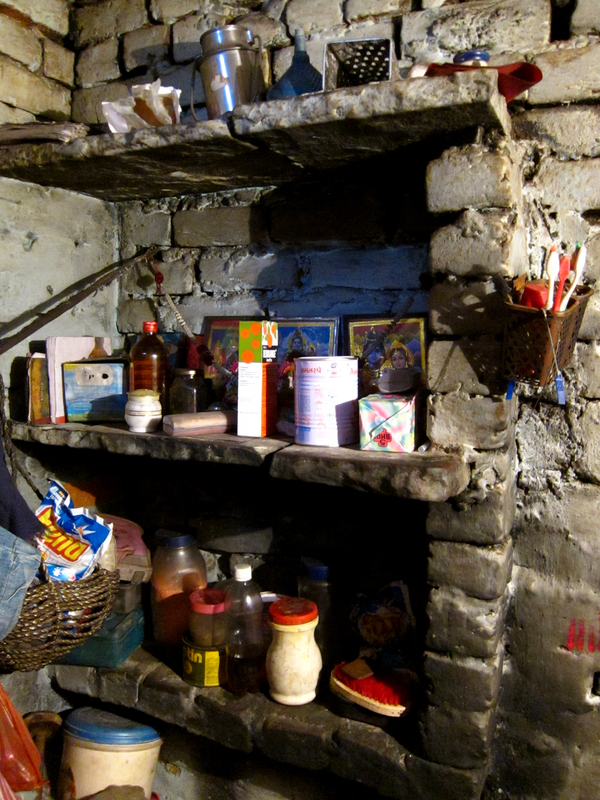 Six people socialize, cook, eat, clean, and sleep in this tiny dwelling. 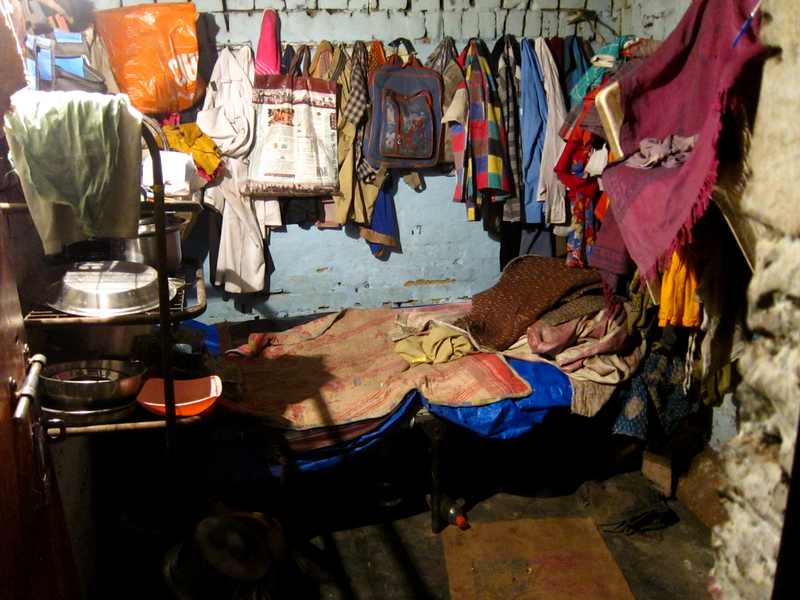 But even more amazing is the fact that Santosh was born in this room on December 23, 2011! 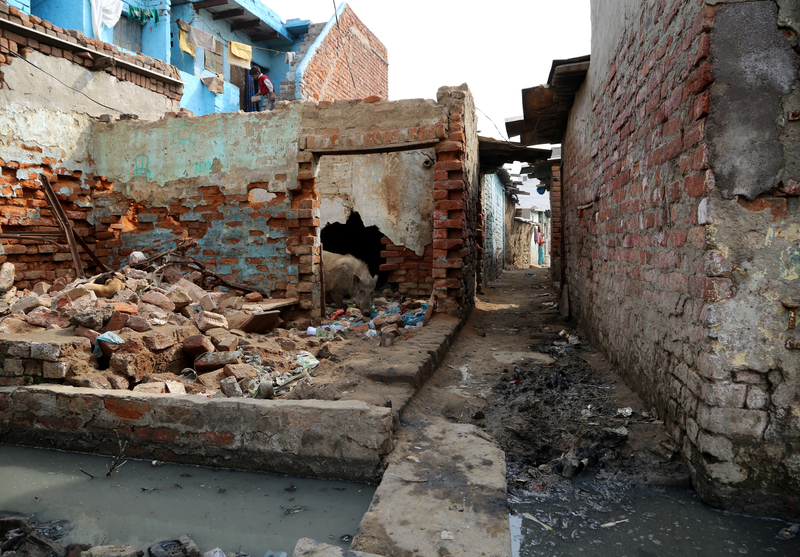 I was here, walking through this slum several hundred meters away while Sugo Devi gave birth to Santosh right here on this bed. Yet again, shivers shot down my spine as I stood in the dark doorway trying to picture that scene. I imagined the cringing chaos, noises, and blood that must have filled that room on December 23. 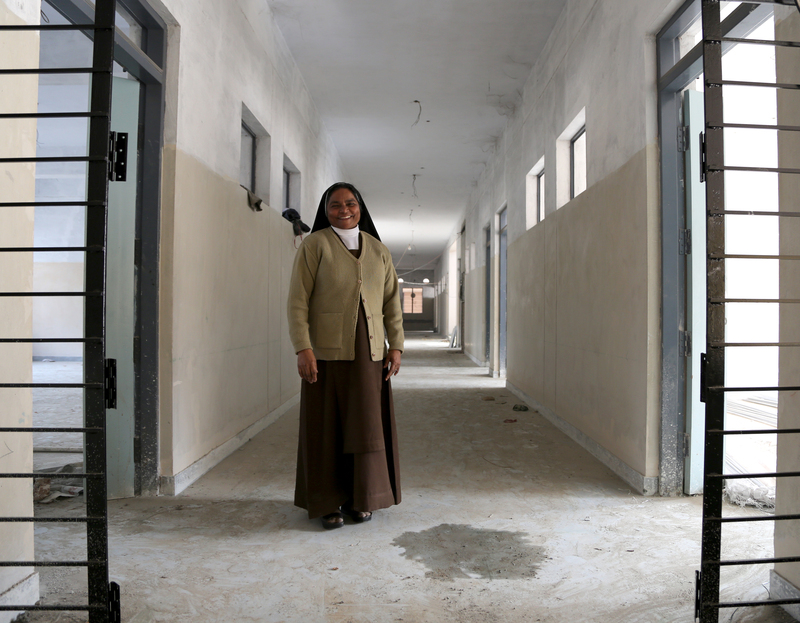 I could hardly believe anyone would give birth in a place like this, especially with doctors and dozens of hospitals within 10 km. 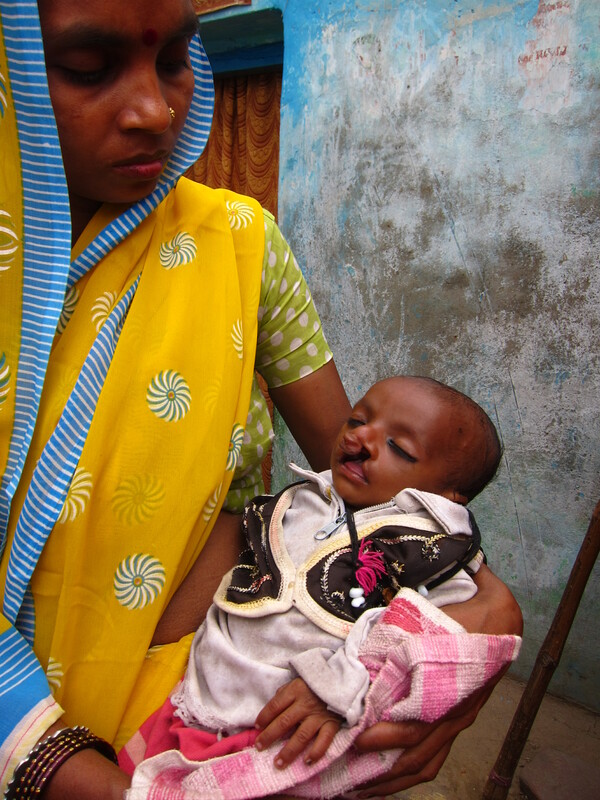 The Indian government would have even paid Sugo Devi to deliver her child in a hospital. 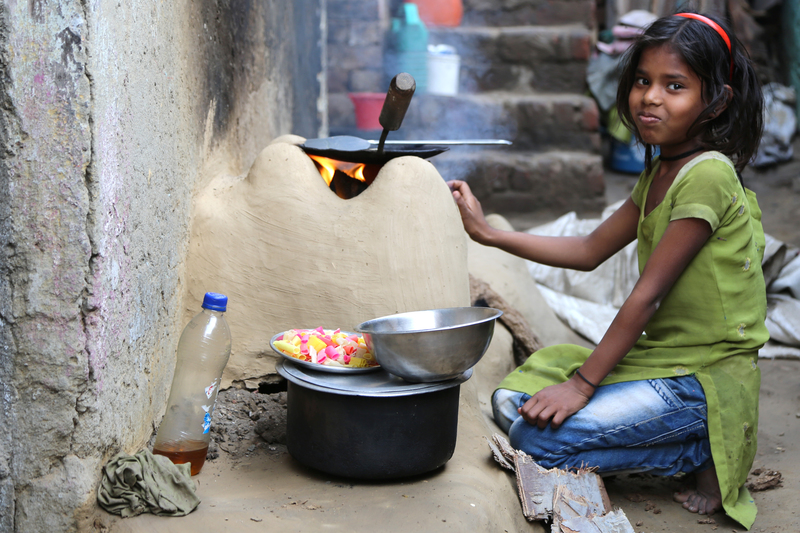 However, almost all of the slum residents still opt to deliver their children at home. We said thank you for the hospitality and carried on. Although we didn’t find any more children we could help immediately, we made our presence and mission known to the entire community. I still wonder how many more children are out there? 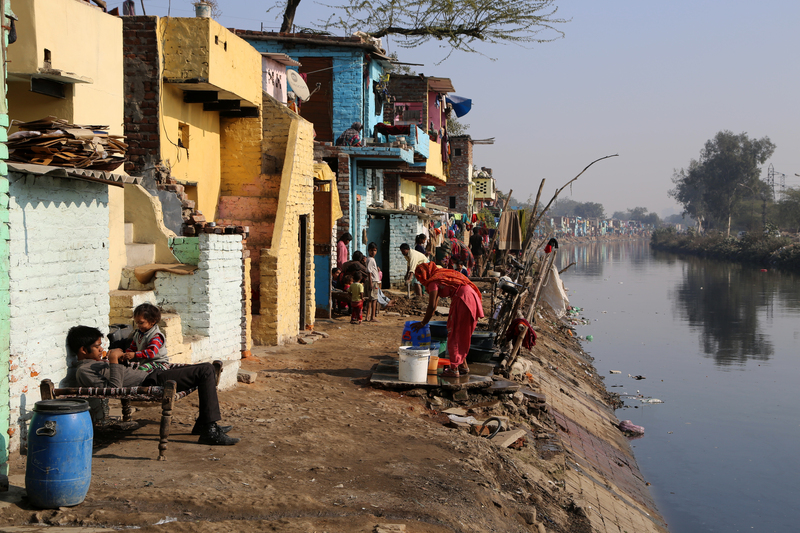 This is just one slum with 25,000 people and we have already found multiple overlooked children with severe and treatable conditions. 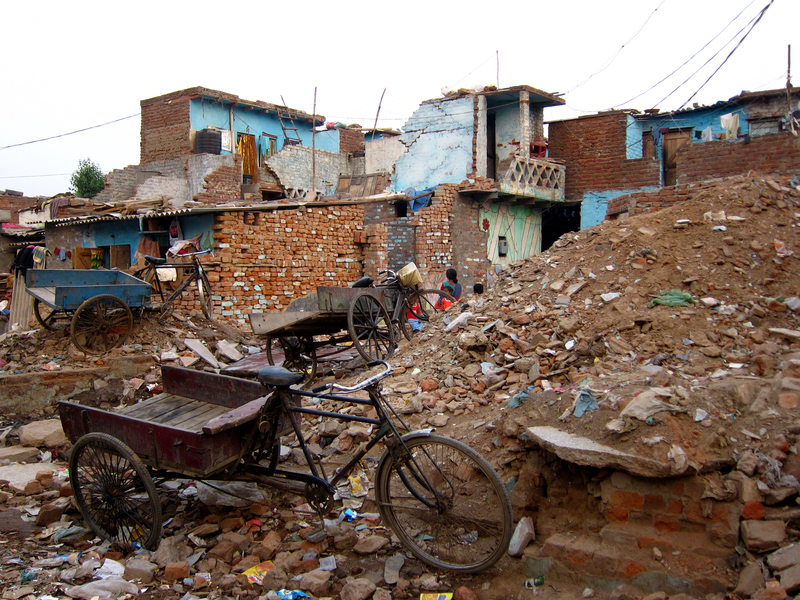 There are more than 65 slums in Faridabad alone! We don’t know who’s out there, but we will never know if we don’t look. It is my honor to introduce to you now our newest campaign, Healing the Hidden. 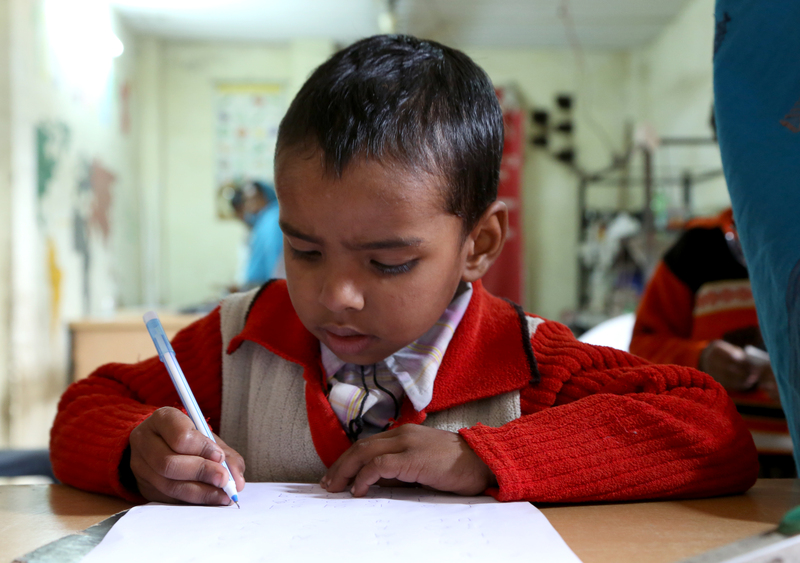 Separate from the Squalor to Scholar Program, Healing the Hidden is attacking the lack of medical care and negative stigma about disfigured children head on. 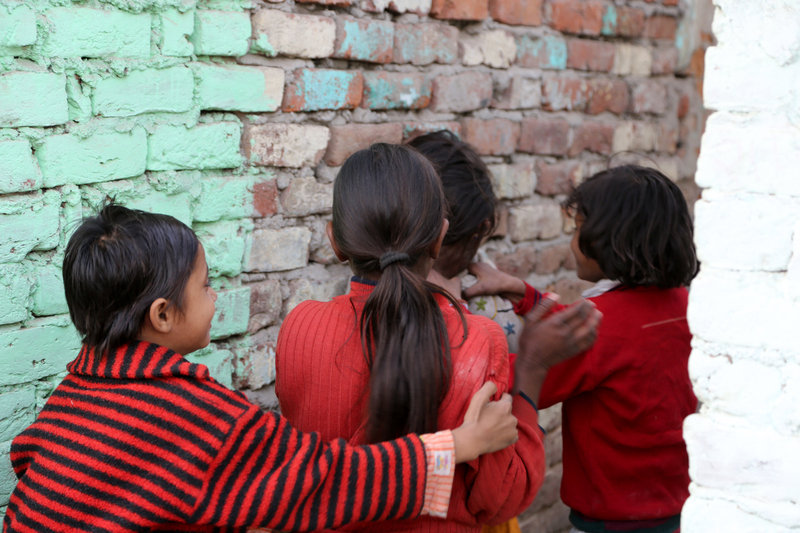 The purpose of Healing the Hidden is to provide medical treatment to overlooked slum children who might otherwise never receive the treatments they need and deserve. 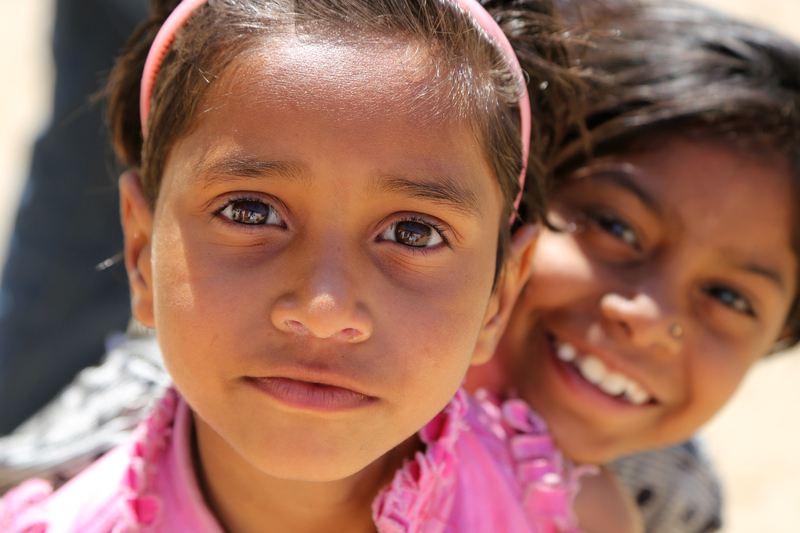 Your donations will help us seek, discover, and treat ailing children as well as educate their communities about healthcare options. The new campaign is live and accessible via the blue link above. 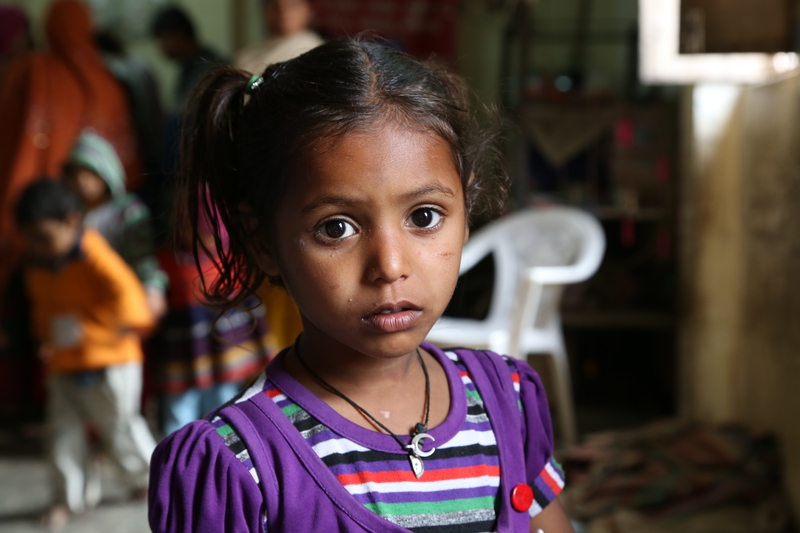 Your donations will help pay for these children’s consultations, diagnostic tests, treatments, transportation to and from hospitals, and medications. 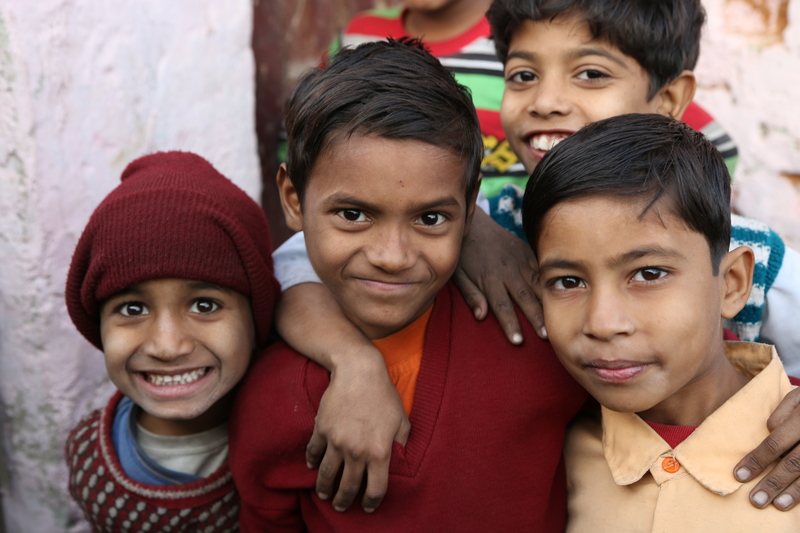 As with the Squalor to Scholar Program, every single penny of your donations to Healing the Hidden (except for small transaction fees) will go directly to children like Santosh, Manish, Moni, Prianka, and Chandni. 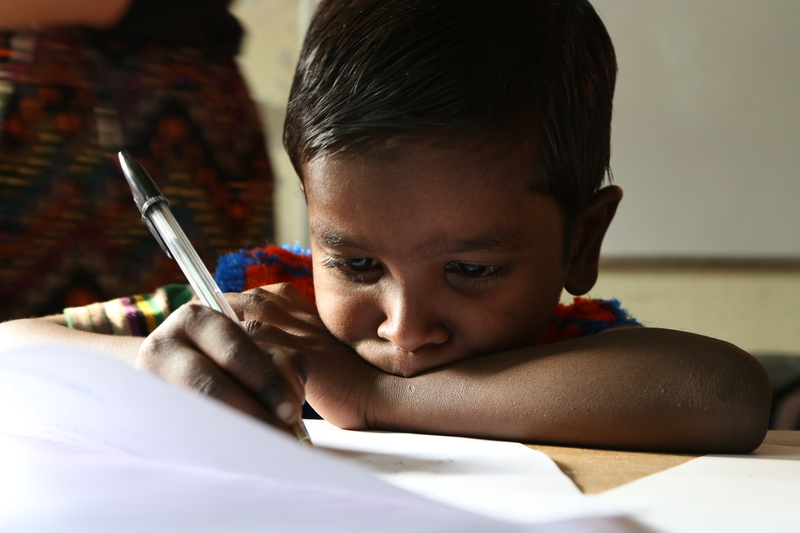 Even Mithlesh, who lives in the slum, is working voluntarily out of his own goodwill because he knows what an incredible impact we are making. 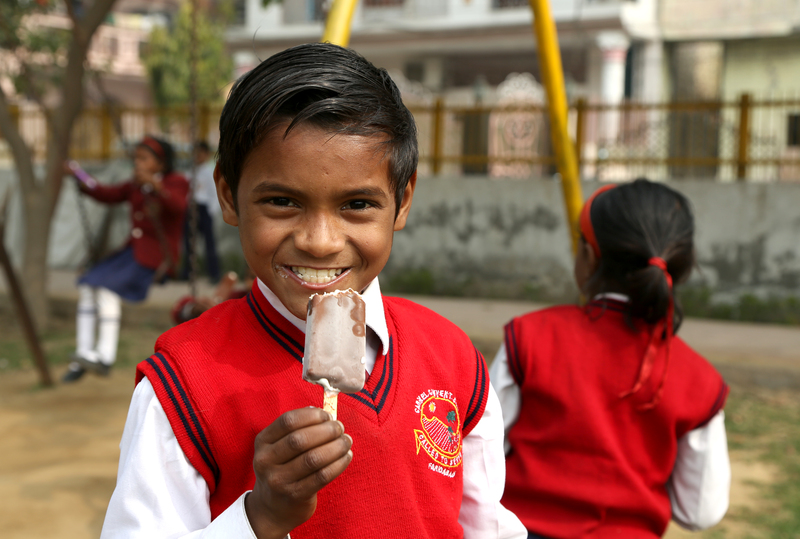 Every dollar will make a difference. Where else can you so easily, directly, and rewardingly donate cures, smiles, and life to people who truly need your help? On behalf of the children and families receiving your care and generosity, thank you!